This document is a user manual for the Lampyre application (hereinafter the Application), which is designed for analytical processing of data obtained by way of investigative activities conducted in landline, mobile, wireless and radio communication networks. Making arbitrary queries to data allowing data to be received based on any defined parameters. Visualizing query results in tables. Visualizing query results on schemas (graphs). 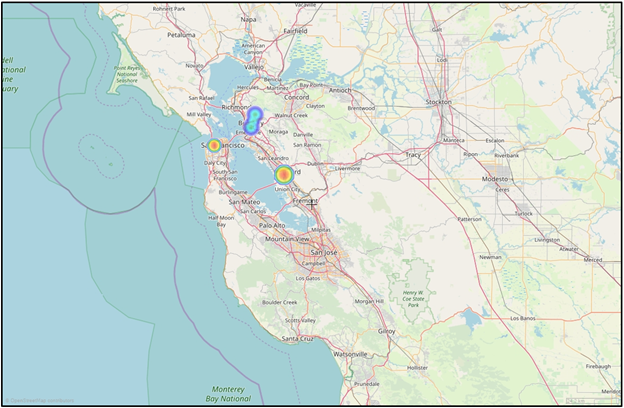 Visualizing query results on GIS-maps. Use of other analysis tools. Ability to manually add data to be analyzed, etc. An object - which is a system element allowing data to be allocated to a category with certain properties (attributes), for example (for billing data), a subscriber phone number or his/her name. 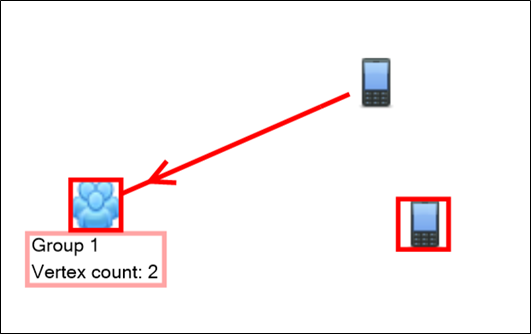 A link - which is an established relation between objects, for example (for billing data) a call made from one number to another. An object or a link type - which is their category. An instance - which is a specific object type or link type that refers to a particular data set. An instance is created on the basis of an object type or a link type. An attribute - which is a description of certain properties pertaining to an object or a link. Each object and link has its own attributes. Every object can have one or several attributes. The same thing goes for every link type. All data and operations performed on them are contained in the investigation. Queries are made and analytical processing is performed within investigations. The Application provides three main tools for visualization: a table, a schema, and a GIS map. Both preset and user defined analytical methods are used for the analytical processing of data. A custom analytical request is a module written in Python that implements API. The module allows the user to create custom analytical requests, describe custom object types, and link types. Double click the Application icon on the PC desktop (Figure 1) or click the Application icon in the Quick Access toolbar (Figure 2). In the window that appears, select the Application operating mode (Figure 3). Note: In the offline mode, you cannot connect to the server and work with external data types and methods. The Getting started window of the Application appears (Figure 4). To get started with the Application, you need to create a new or select an existing investigation. To do this, right click the corresponding item in the getting started window (Figure 4). Note: When you select Import file, the investigation is created automatically. Section 2 of this manual describes how to work with investigations. Upon launching an investigation, the main window of the Application is opened (Figure 7). Any of the above actions loads data to be analyzed in the investigation. Section 3.3 of this manual describes how to work with requests. Section 3.1 of this manual describes how to import files. Section 2.5 of this manual describes how to work with instances. To save data, select File → Save in the main menu of the Application (Figure 5). The data are saved. In the upper portion of the Application window, click the close button (Figure 6). The Application is shut down. Upon signing in, the main window appears. Figure 7 shows the main window of the Application. the current balance is displayed in the upper right portion of the window. working area - located in the center of the window. The Main menu is used to navigate to various windows displayed in the working area. 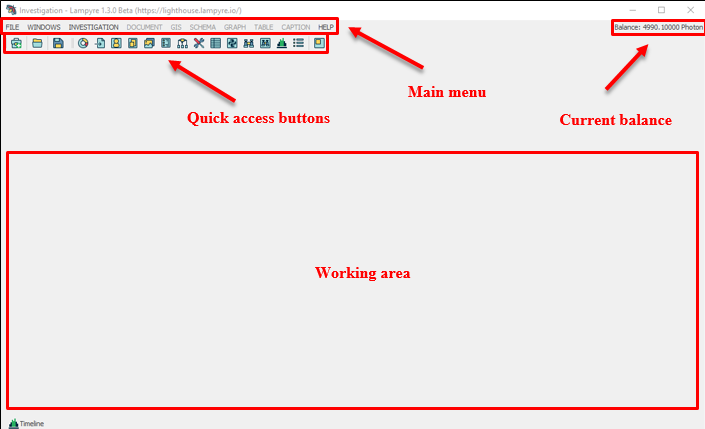 The quick access buttons and the Main menu are always available in the Application, regardless of the window you are currently using. Sections 1.4.2-1.4.4 describe the most important items of the Application's main window. The Main menu contains items used to control the Application and its interface. The Main menu is always available in the Application regardless of the window you are currently using. Figure 8 shows the main menu of the Application. You can close any open window of the Application by clicking the button. You can configure each window of the Application to close automatically when the button is clicked. The Application Main Menu items are described in Table 1. A drop-down list of items that can be applied to a document. Quick Access toolbar provides efficient access to the Application controls. Quick Access toolbar is always available in the Application, regardless of the window you are currently using. 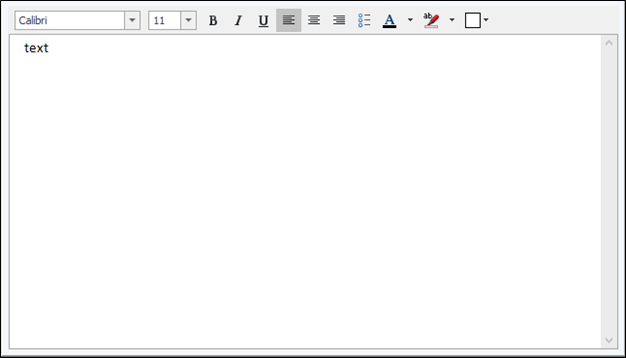 Quick Access toolbar is shown in figure 9. The buttons of the Quick Access toolbar are described in Table 2. The working area of the Application displays various windows. The appearance of these windows, their functions and control items depend on their purpose. Service windows are windows that provide for data handling. For example, Requests, Import, Instances, Explorer, etc. The main menu is used to access the service windows of the Application. Documents are windows that display the results of data processing. For example, schemas and tables created to display the Application output. Certain actions in the Application can be performed using hotkeys. See Table 3 for the hotkeys used in the Application. Ctrl + Shift + + To increase the size of a vertex caption. You select a vertex and press the hotkey. Ctrl + Shift + - To decrease the size of a vertex caption. You select a vertex and press the hotkey. An investigation is a set of operations performed to tackle a certain task. An investigation may be made of the following parts: a request, a GIS map, a report, etc. All received and processed data are contained within a single investigation. In the main menu of the Application (Figure 10), select File → New investigation. The New investigation window (Figure 11) appears. Click Save. A new investigation is created. The investigation file is saved in the selected folder. 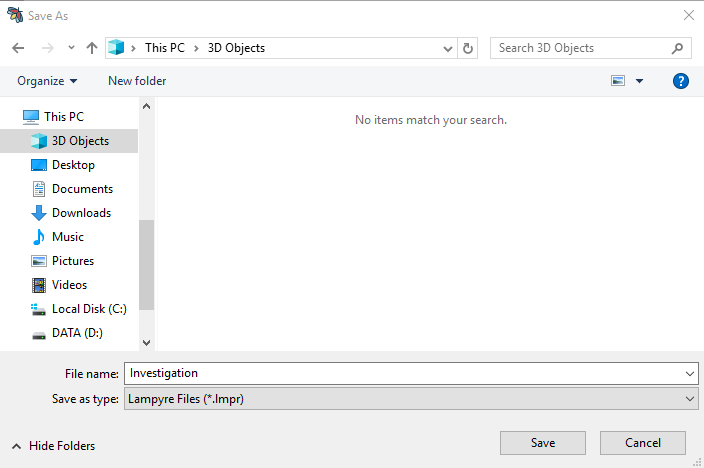 The name of the investigation is displayed in the upper portion of the application window in the following format: Name-Lampyre build version (Figure 12). In the main menu, select File → Save to file as. The Save window opens (Figure 13). 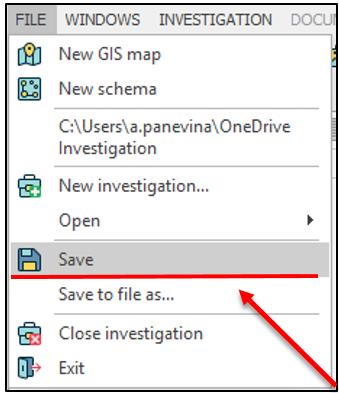 Specify the path for saving, modify the investigation name and click Save. A copy of the investigation is saved under a new name. In the Main menu, select File → Open → File. A file choice window on the user's PC will open. Right click the name of the investigation file you want to open. The investigation is opened, all its data are loaded into the Application. To close the investigation, select File → Close investigation in the Main menu. The investigation is closed. Any work that involves specific system data is executed using instances. An instance is a specific object type or link type that refers to a particular data set. An instance is created on the basis of an object type or a link type. Each object and link has its own attributes. Every object can have one or several attributes. Same thing goes for every link type. An object is an instance of a link type, a graph vertex, a graph link, a GIS map object, etc. The same instance can be present on different schemas and GIS maps. If you delete an object type or a link type through the Instances window, then it is deleted from the Application. An instance can be created manually or automatically. For more info on how to create an instance manually see sections 2.5.3-2.5.4. For more info on how to create an instance automatically see section 2.5.5. Instances are processed in the Instances window. The Instances window is described in section 2.5.2. The operations that you can execute in the Instances window are described in section 2.5.6. 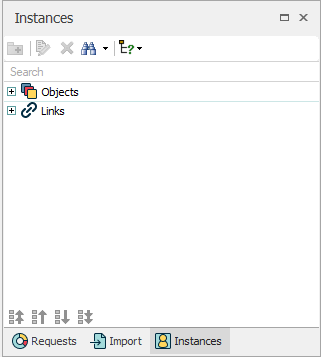 The Instances window contains a list of all the object types and link types that are defined in the Application. Open an existing investigation or create a new one. Operations with investigations are described in sections 2.1-2.4. In the Main menu, select Windows → Instances. The Instances window appears (Figure 14). The Instances window items are described in table 4. Object instances are created via the Instances window. Open the Instances window. For more info on how the window opens see section 2.5.2. 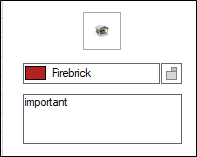 In the Instances window right-click the icon or the object type name for which you want to create an instance. The context menu opens (Figure 15). 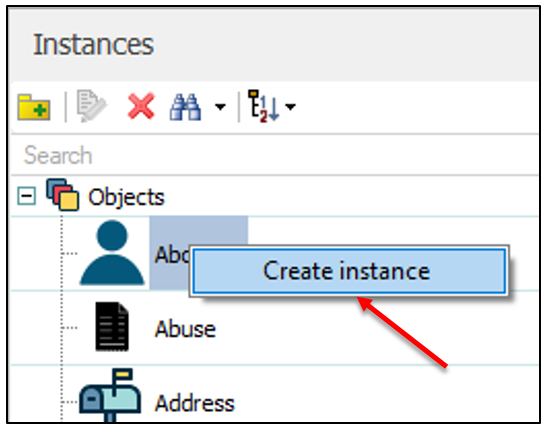 Select the Create Instance operation from the context menu. The icon appears to the left of the selected object type. Attributes specified for this instance type by default are assigned to the created instance. Click the icon that appears after the new instance is created. To open the drop-down list for the created instance. By default a new instance has no name and empty attribute parameters. To add attributes of the selected type, right click the required object attribute type and select Add value in the menu that appears. Attribute of the selected type is added. To set the parameters for an instance click on the relevant attribute icon and then either click the button or press F2. An editable string appears to the right of the selected attribute icon. Link instances are created via the Schema window. Create instances for objects. For more info on how to create objects see section 2.5.3. Create a schema. To do this, in the Main menu select File → New Schema. For the detailed description of how to work with a schema see section 4.3. In the Graph tab context menu select New Graph. Add vertices to the working graph area. For example, two objects, as shown in figure 16. You can also add objects by selecting Add Data → Instances in the Graph tab context menu. To add a link to the schema, in the item panel of the schema window click the button or in the Main menu select Graph → Add Link. Click the button then draw a link from one object to another with the left mouse button. The Link Type Settings window appears (Figure 17). 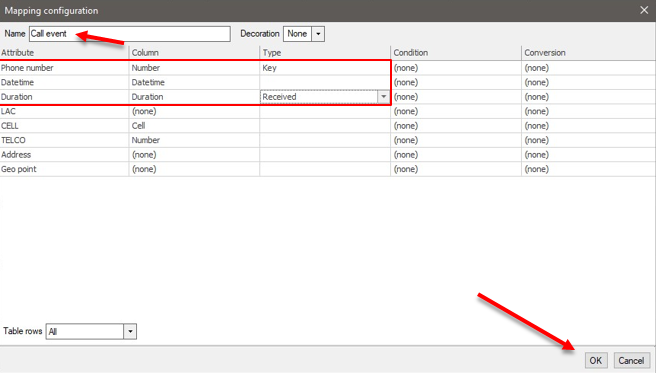 In the Attribute Collection column of the Attributes tab click the attribute that you want to assign to the link instance being created. The attribute will be highlighted. In the Attribute Collection column menu, click the button. The selected attribute will be added to the Type Attributes column. Repeat this step for all the required attributes. In necessary, modify the basic parameters in the General tab. If necessary, modify the parameters in the Graph-Link tab. 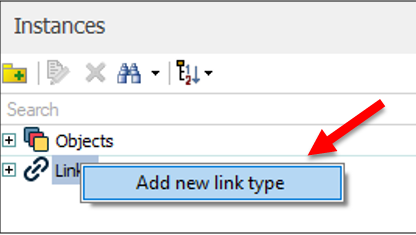 Click OK. A new link instance will be created and displayed in the Links list in the Instances window (Figure 18). The Link Type Settings window items are described in Tables 8-9. Representation links the table columns to the instances displayed. When a schema is built using a table, the table is first converted into instances, then the graph is created in accordance with those instances. When representation is applied, then instances, vertices, and edges are built. In the Main menu, select Windows → Requests. The Requests window opens. 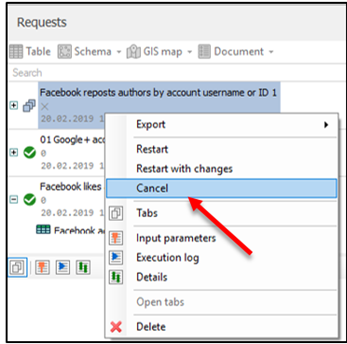 Double-click on the request string or click on the Table button in the Requests window menu. A table with data about the request opens (Figure 19). 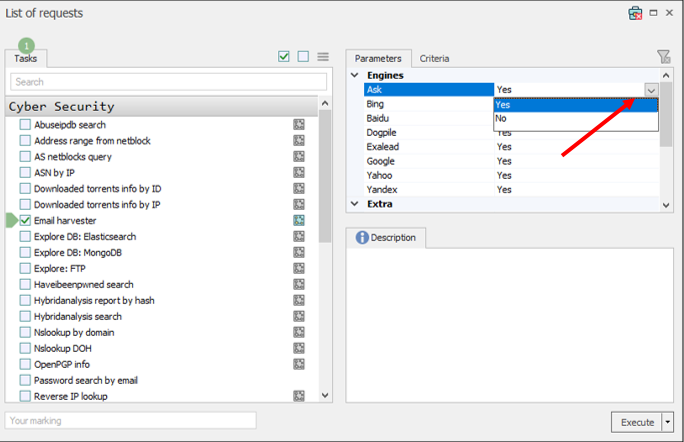 In the Requests window menu select Schema. Next select the parameters for the schema you want to create from the drop-down list (Figure 20). For example, Schema → Complete → All types. A schema will be built. In the Main menu, select Windows → Instances. The Instances window opens. All of the instances created for objects will be displayed in the Instances window. Each instance is filled in with data in accordance with the specified representation. On the basis of the instances a graph is built where each table row is transformed into a link between two objects (Figure 21). The operations with an object instance or a link instance are executed the same way. Operations with instances are performed through the context menu by right-clicking on the instance with which an action is to be performed (Figure 22). 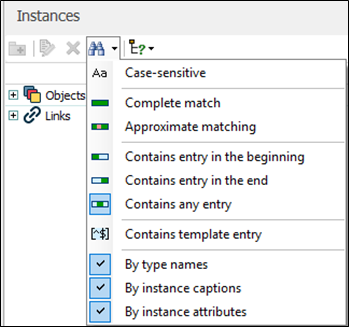 Operations with instances in the Instances window are described in sections 2.5.6.1 - 2.5.6.5. In the instance list, right-click an instance. Context menu opens (Figure 22). 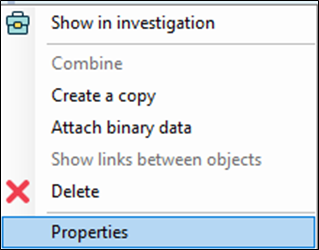 In the context menu, select the Show in Investigation operation. The selected instance will be highlighted in all the visual analysis tools of the investigation: on a schema, a GIS map, etc. Select two instances by left-clicking on them while holding down the Ctrl key. Right-click on any of the selected instances. 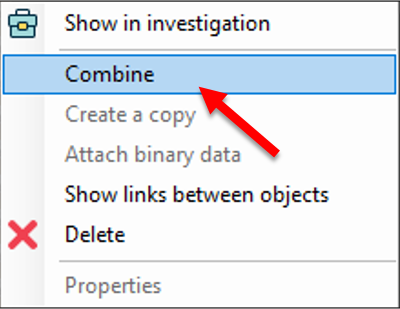 A context menu opens with the Combine operation to choose (Figure 23). Click Combine. The selected instances will be combined. To set the sorting parameters for the combined attributes, click the button and select the desired sequence. In the shortcut menu, select the Create Double operation. A duplicate of the selected instance is created. Select two or more instances by clicking on the instances while holding down the Ctrl key. Right-click one of the selected instances. The Links Between Objects operation (Figure 23) becomes available. 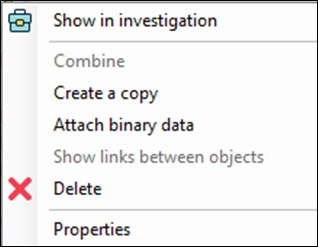 In the context menu, select the Links Between Objects operation. The selected instances will be linked. Select the instance by right-clicking on it. Context menu opens (Figure 22). In the context menu, click Properties. The Properties window opens (Figure 24). 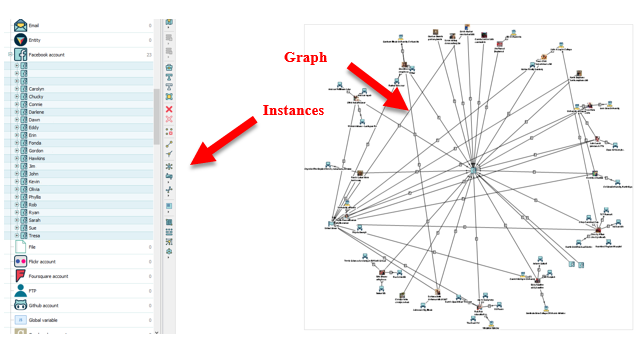 To apply changes to an existing graph, it is necessary to click on the instance with changed properties, or to switch to another tab. The instance attributes are described in Table 5. Text color Drop-down list for selecting a text color. Click the button to select color parameters. Font Drop-down list for selecting a font type. Click the button to select font parameters. Custom Drop-down list for selecting a line color. Click to select color parameters. Fill color Source Click the button to select a source. Custom Drop-down list for selecting fill colors. Click to select color parameters. View Representation Click the button to select a representation. Line type Click the button to select a line type. Framing Click the button to select a framing. Other Hide Click to select a parameter. Lock Click to select a parameter. Tree root Click to select a parameter. General Show note Click to select a parameter. Text Show text Click the button to select a parameter. Background color Drop-down list for selecting a background color. Click to select color parameters. Show frame Click the button to select a parameter. Frame color Drop-down list for selecting a frame color. Click to select color parameters. 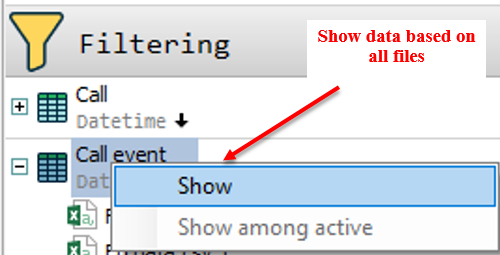 Show line before text Click the button to select a parameter. Click Close. The Properties windows is closed. New object instances are created via the Instances window. 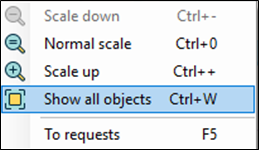 In the Instances window, right-click on the Objects string. Context menu opens (Figure 25). In the opened context menu, select the Add New Object Type operation. The Object Type Settings window opens (Figure 26). In the Object Type Settings window, fill in the Name field. In the Attributes tab, in the Attribute Collection column, click on the attribute that you want to assign to the object being created. The attribute will be highlighted. Note. An object type cannot exist without attributes. 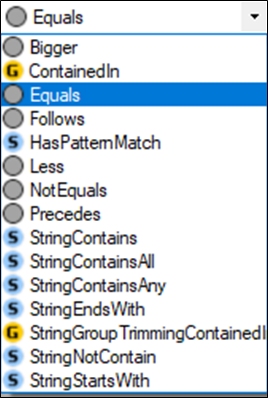 In the Type Attributes column, check the identifying attribute. 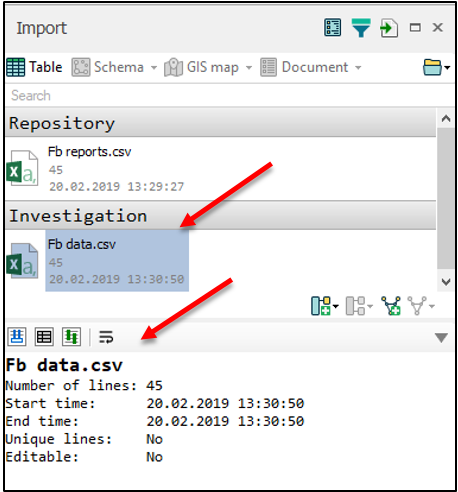 Note - The identifying attribute specifies how different instances are combined when building and also specifies which values will govern the data in the investigation. When represented on a schema, the identifying attribute will be unique. Non-identifying data is combined into arrays. If necessary, in the General tab of the Object Type Settings window, modify the basic parameters. In the Object Type Settings window, click the Graph Vertex tab. Change the parameters, if necessary. 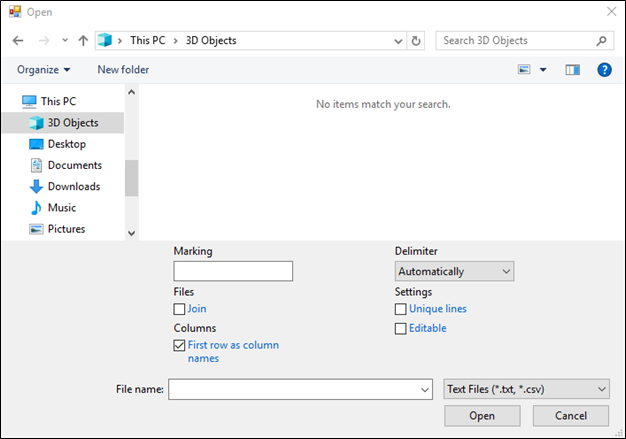 Click OK. A new object type will be created and displayed in the Objects list in the Instances window (Figure 27). In the Instances window, right-click on the created object type. Context menu opens (Figure 28). 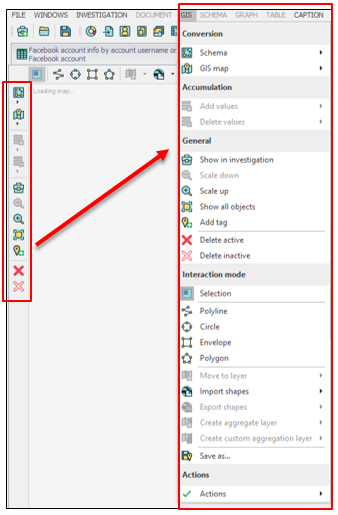 In the context menu, select the Create Instance operation. An instance is created for the selected object type. Fill in the instance with data. An example of filling in is shown in Figure 29. The Object Type Settings window items are described in tables 6-7. Text color Drop-down list for selecting a text color. Click to select color parameters. Font Drop-down list for selecting a font type. Click to select font parameters. Line color Source Click the button to select a source. View Framing Click to select a parameter. Representation Click the button to select a representation. Show text Click the button to select a parameter. In the Attribute Collection column (Figure 26), click the button. The Attribute Configuration window opens (Figure 30). Select the common settings for displaying the attribute. Click OK. The new attribute is displayed in the Attribute Collection column. An object attribute must have at least one value. If it has multiple values, they may be deleted. In the Attribute Collection column (Figure 26), click on the user-created attribute that you want to delete. The attribute will be highlighted. Click . The attribute is removed from the Attribute Collection column. New link instances are created via the Instances window. In the Instances window, right-click on the Links string. 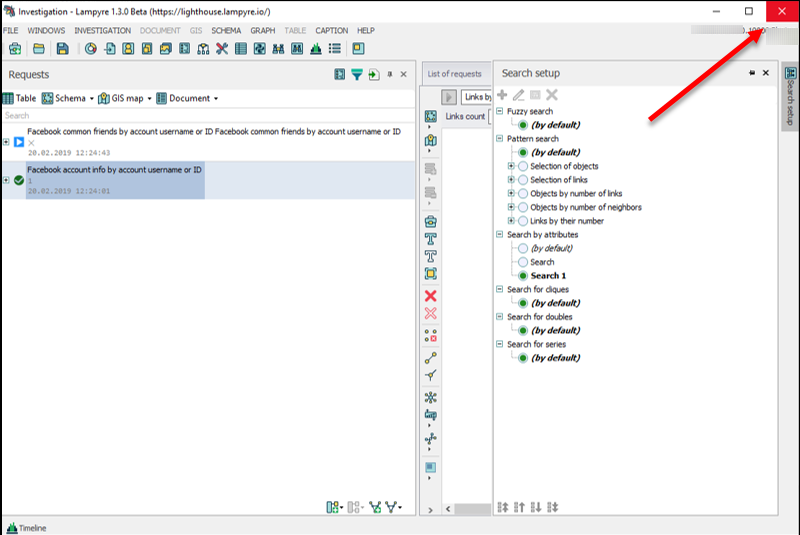 A context menu (Figure 31) opens. Select the Add New Link Type operation. The Link Type Settings window opens (Figure 17). 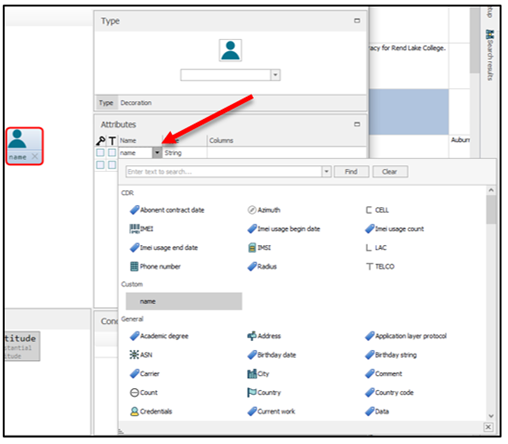 In the Attribute Collection column of the Attributes tab click the attribute that you want to assign to the link type being created. The attribute will be highlighted. Note. A link type cannot exist without attributes. If a link is created without attributes, the Void attribute is assigned to it. The Void attribute allows creating pseudo-link lines between objects. In the Link Type Settings window, select the General tab. Change the common settings, if necessary. 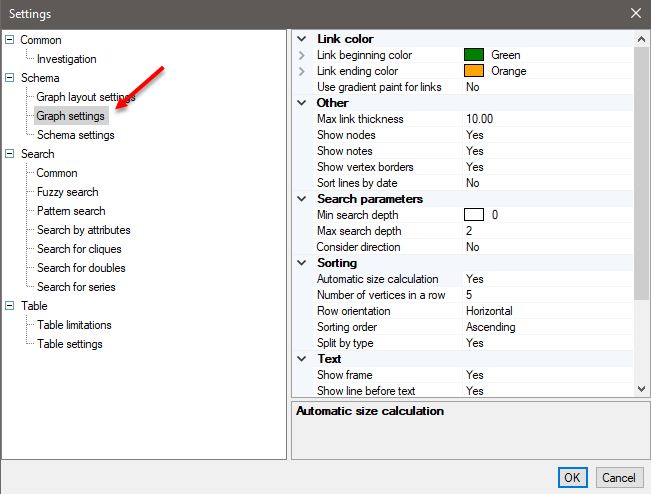 In the Link Type Settings window, click the Graph-Link tab. Change the parameters, if necessary. Click OK. A new type of link will be created and displayed in the Links list in the Instances window. Naming the link which is being created. Drop-down list for selecting a type of the instance to start the link with (for example, entity, object, point). Drop-down list for selecting a type of the instance to end the link with (for example, entity, object, point). View Curve Click to select a parameter. 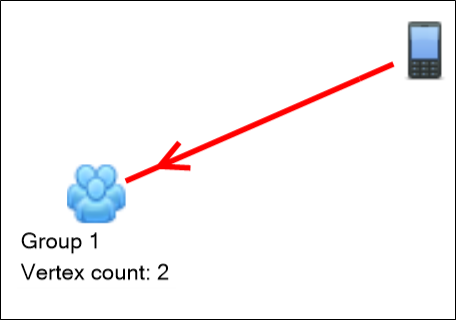 In the Attribute Collection column (Figure 17), click the button. The Attribute Settings window opens (Figure 32). A link attribute must have at least one value. If it has multiple values, they may be deleted. In the Attribute Collection column (Figure 17), click on the user-created attribute that you want to delete. The attribute will be highlighted. Into the repository. Files are stored in a database separately from investigations. These files can be shared between investigations. When an investigation containing a link to a file stored in the repository is moved to another PC, the imported files are not moved along with it. Into an investigation. The file is uploaded into the database inside the investigation. When such an investigation is moved to another PC, the imported files are moved along with it. Open an investigation. The operations with investigations are described in section 2. In the Main menu select Windows → Import. Import window opens (Figure 33). The Import window items are described in table 10. Import a file into the Application. For details on how to import files into the Application, see section 3.1.4. Export. It allows you to export the file into the following formats: TXT, CSV, HTML, XLSX. Parsing. It lets you to view the statistics of the imported file (Figure 35). Header. It allows you to view types of the data stored in the uploaded file's columns. Details. It lets you display the information about the file contents. Delete. It allows you to delete the file. Similar operations are used to import files into both the repository and investigation. Let us discuss how to import a file into an investigation. In the Import window menu select . A list used to select a location to import the file opens (Figure 36). For example, select Upload to investigation. A file selection window on the user's PC appears (Figure 37). Select a file on PC and click Open. The file is uploaded into the currently opened investigation. 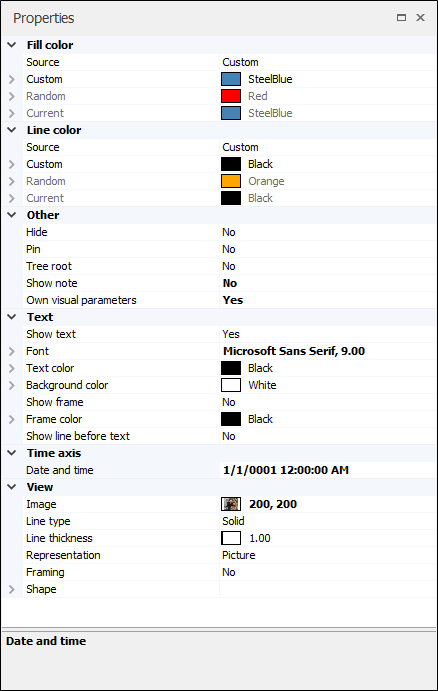 See Table 11 for a description of items in the Open window displayed when uploading a file from the user's PC. It allows you to take the column name from the first row. When this checkbox is deselected, the table columns are named as follows: Column1, Column2, etc. Only files with the same structure can be combined. 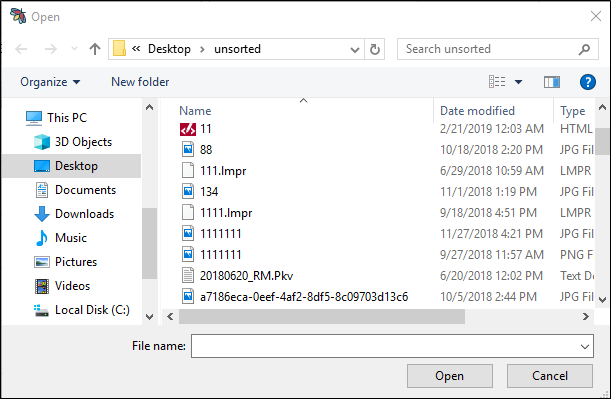 When combining files with different structures, the highest priority belongs to the structure of the first file in the list sorted alphabetically by name. 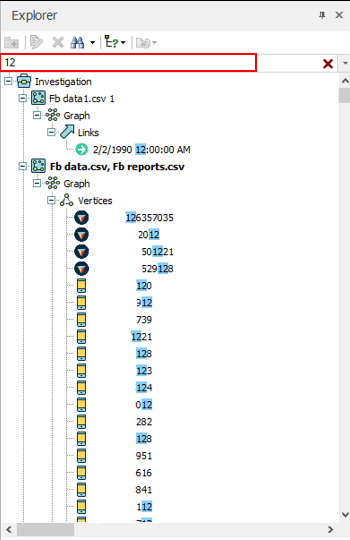 Data of files with another structure is not uploaded. For example, select Upload to investigation. The Open window opens to choose a file on the user’s PC (Figure 37). In the Open window check Join. Press and hold Ctrl then select two files with the same structure (data format and type) and click Open. The files are uploaded into the investigation currently opened in the Application (Figure 38). Names of the uploaded files are displayed in a single file. To view results of uploading and combining, double click the name of the uploaded file. A custom analytical request is a module written in Python that implements API. The module allows the user to create custom analytical requests, describe custom object types, and link types. User ontologies. User ontologies are files that describe object and link types, but do not describe custom tasks. Custom requests. Custom requests should contain custom scripts implemented programmatically via the provided API. Custom request files may contain user ontology. 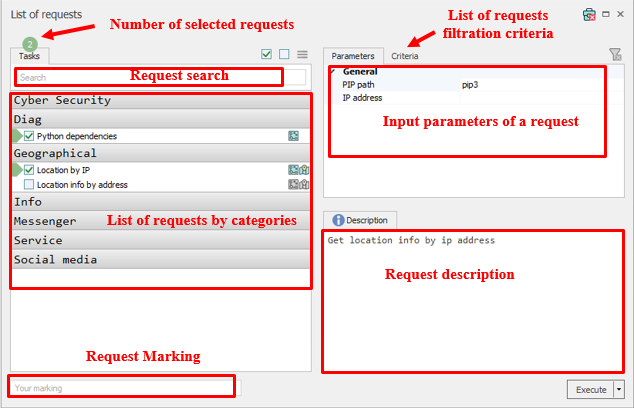 A request includes its name and the category in which it is displayed when loaded into the List of requests. 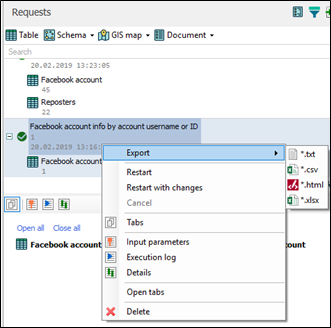 In a custom request, the user may add the ability to automatically fill in the input parameters using the data on a GIS map or graph as well as to execute analytical requests and receive results automatically. Fill in the input parameters of a request. Receive the results onto the initial tab. 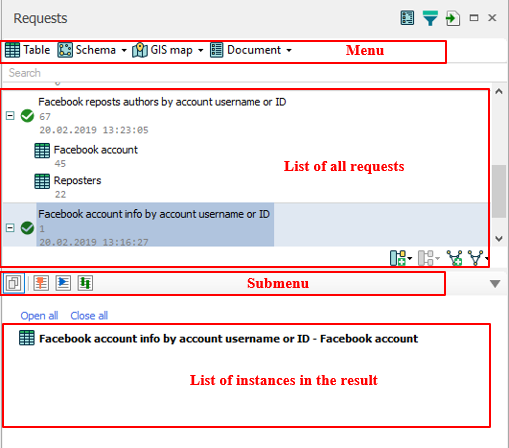 When working with a schema or GIS map, to launch a macro, use the instance context menu. The Requests window is used to perform initial operations with custom requests. In the Main menu select Windows → Scripts. The Scripts window opens (Figure 39). The Scripts window items are described in table 12. Open the Scripts window. This step is described in section 3.2.3. To upload a script from files in the Scripts window, click . To upload a script from a folder, in the Scripts window, click . 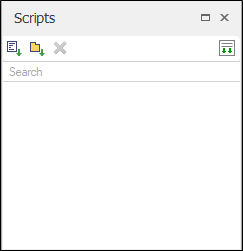 The Open window is opened where you can select a script (or a folder containing scripts) on the user's PC. In the Open window, click a script to select it. The script is highlighted. In the Open window click Open. 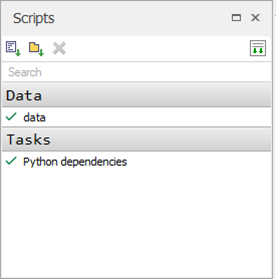 The selected scripts are displayed in the Scripts window (Figure 40). When uploaded, these scripts are available for execution in the List of requests window. Note. If the file you import contains only an ontology, it is displayed in the Data box of the Scripts window when uploading is complete. If the imported file contains ontology and custom requests, this file is displayed in the Tasks box of the Scripts window. A table is a tabular representation of the data obtained by executing a request. Distribution of data into columns is used to analyze data in a table. A table may be generated for any request. A schema is a graphical representation of request execution results. It allows the data to be analyzed and interpreted using a set of special tools. A schema can be generated when an icon is displayed in the request string . When this icon is missing, you can build a schema based on the generated table manually using the tools in the Create template window. A GIS map is representation of request results bound to geographical location of the data. A GIS map can be generated when icon is displayed in the request string. When this icon is missing, you can build a GIS map based on the generated table manually using the tools in the Create template window. 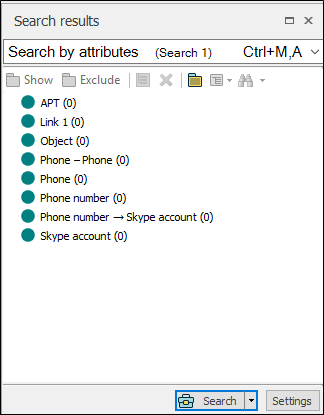 The List of requests window is shown in Figure 41. All executed requests are displayed in the Requests window. 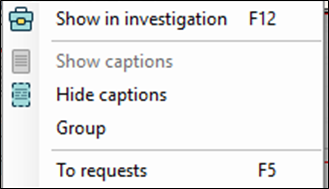 To open the Requests window, select Windows → Requests in the Main menu. The Requests window opens (Figure 42). To modify a request name, you need to click the request in question and press F2 on the keyboard. The request name text becomes editable. When all the changes are made, press Enter. The Requests window items are described in table 13. In the Requests window, the request status precedes the request name. Table 14 shows possible request statuses. In the Main menu select Windows → List of requests. The List of requests window opens (Figure 43). In the left area of the window that appeared check the string of a request you need to execute. For example, in the Cyber Security section check Email harvester. The input parameters of the request are displayed in the right portion of the List of requests window (Figure 44). You can select one or more requests at a time. In the right-hand area of the Parameters window, modify the required parameters by clicking the drop-down list button for each parameter string (Figure 44). Parameters may be set both manually, by placing a special separator character in the corresponding field, and uploaded from a text file. By default, the Interval start parameter is set to the current date. If necessary, it can also be modified. Click Execute at the bottom of the List of requests window. The request is executed. Note. If any parameter is omitted or set incorrectly, when you click Execute, a message window opens. Click OK and modify the parameter specified in the message. The List of requests window (Figure 43) items are described in table 15. A request script can be searched by both its name and the criteria of its operation. In the Search field, type the full or partial name of the request script you need to find (Figure 45). A list of corresponding request scripts is displayed under the search field. The words that match the search string are highlighted (Figure 45). In the Criteria area, check the names of the required criteria of the request script operation (Figure 45). The list of request scripts that meet the defined criteria is displayed under the search field. Requests are marked in the List of requests window. For information of starting requests, see section 3.3.4. In the list of requests, check one or more requests. Specify the prefix in the Your marking field. Click Run. In the list of requests, the specified prefix is displayed at the beginning of the selected request name (Figure 47). In the Main menu, select Windows → Requests. The Requests window with the list of requests appears. In the Requests window select a request you want to export. Click the selected request. Context menu opens (Figure 48). Select a format for exporting the request. A window for selecting file storage location on the user's PC. Specify the location to store the file. Click Save. The executed request is saves on the user's PC. Request restart operation allows you to create a request copy. The previously specified input parameters are preserved for the request. In the Requests window select a request you want to restart. Click the selected request. Context menu opens (Figure 49). Select the Restart operation. The request is sent for execution with the same input parameters you specified in the selected request. A sequential number is added to the name of the created request. 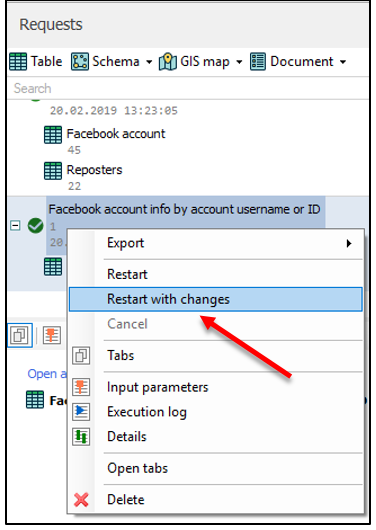 By restarting a request with changes you can create the request copy with modified input parameters. 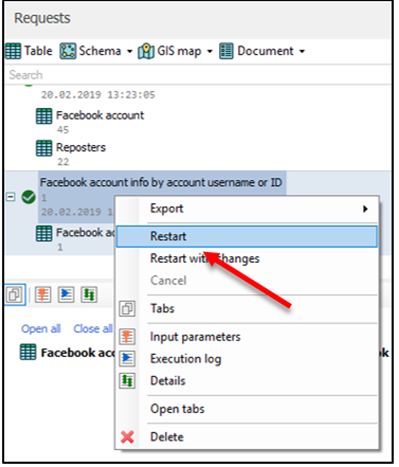 In the Requests window, select the request you want to restart with modified parameters. Click the selected request. Context menu opens (Figure 50). Select Restart with changes. The List of requests window opens. Check the required request. The input parameters of the selected request appear (Figure 51). 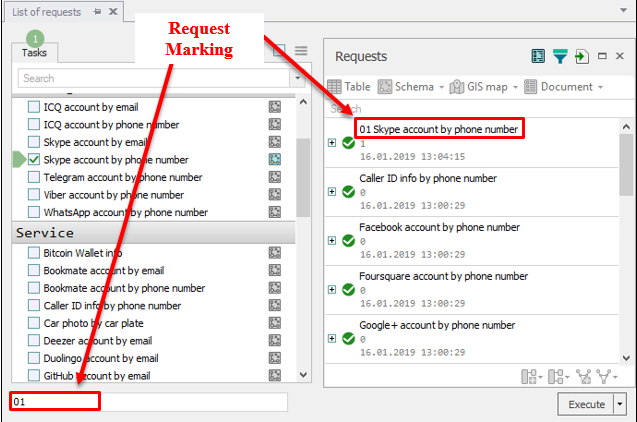 Modify the input parameters of the request. Click Run. The request is executed with the modified parameters. Use the Requests window to view the executed request. A request can be canceled only during the process of its execution. In the Requests window, select a request that is being executed. Click the selected request. Context menu opens (Figure 52). Select Cancel. Request execution is canceled. The request status is changed to . In the Main menu, select Windows → Requests. The Requests window with the list of executed requests appears. In the Requests window select a request you want to delete. Click the selected request. Context menu opens (Figure 53). In the context menu, select Delete. The request is deleted from the Application. All investigation visualizations are listed in the Explorer window. 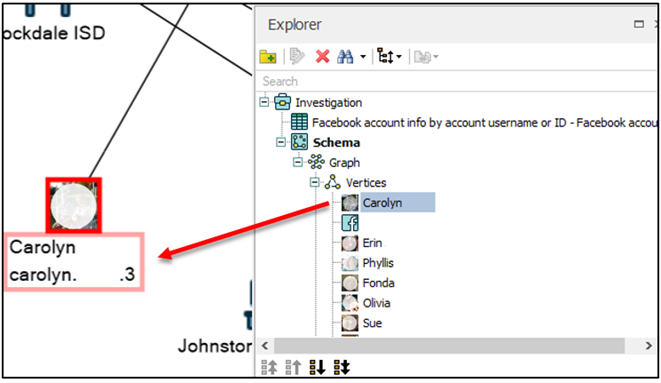 The Explorer window allows you to navigate the entire set of investigation data (Figure 54). To open any object of an investigation (for example, a table, map, schema, etc. ), double click it in the Explorer window. To show items of a schema or map, in the Explorer window, check the required item (for example, a point on a map, instance on a schema, etc. (Figure 55)). The Explorer window items are described in Table 16. A table is a set of data to be analyzed. Each table has its own structure. The used request contains information of the table structure. Besides, this information represent input parameters. Data of tables cannot be edited. Import structured data into the Application. For details on how to import files, see section 3.1. Create a table by executing an analytical request using a script. For information about executing requests, see 3.3.4. Tools for working with tables are available when a table is opened. 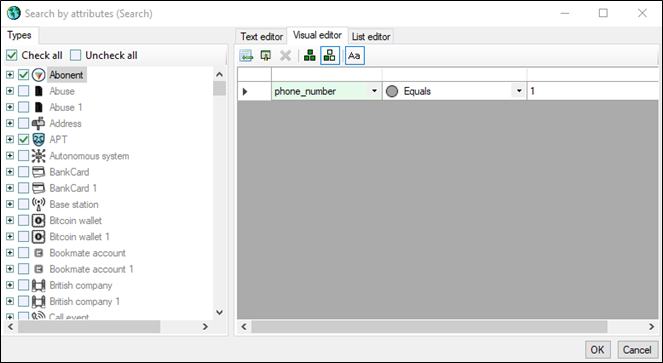 When the window for tabular representation of data is opened, the Table item becomes active in the Main menu. Items of the Table main menu partially duplicate the tools in the sidebar of the request table window (Figure 56). See Table 17 for a description of the Table main menu items. Show in investigation. To use this button, first select strings in a table, then open a window displaying the list of instances (for example, the Instances window). In this case, instances are highlighted for all the highlighted strings of the table. Select columns. It allows you to group columns. The selected columns should be moved into the Select columns window. To move a column from the Select columns window back into the table, double click the name of the required column. Click the drop-down list button by any table column name. A filter window opens that contains the list of unique values of this column (Figure 57). 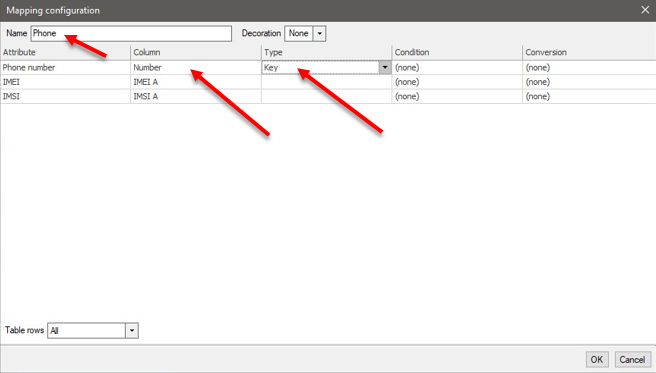 Search for a specific value using the search bar or use the scroll bar on the Values tab. Check one or more values. On the Values tab of the filter window click OK. The table data is displayed based on the applied filter. To search for text values, go to the Text filters tab. Enter the search criteria and search string. On the Text filters tab of the filter window, click OK. The table data is displayed based on the applied filter. Note. Once you have applied a filter by one column, you can filter by another column. In this case, only the data displayed according to the first filter is filtered again. This way you can filter by column data several times. When you filter by different columns the logical AND is always used. Note. When creating a graph based on filtered table data, only the filtered data is displayed on this graph. Row count – specifies the quantity of rows that meets the filter criteria and will be displayed on the graph. Right click any table column header. Table column setting panel appears (Figure 59). See Table 18 for description of table column settings. Group by this column It allows you to group by the column with filter panel opened. When grouping, each unique value of the column represents a group. Double grouping is possible. The quantity of groups cannot exceed 10,000 strings. Show search panel It allows you to perform full-text data search. See section 7.2 for description of table data search. Note. All empty columns are hidden by default. 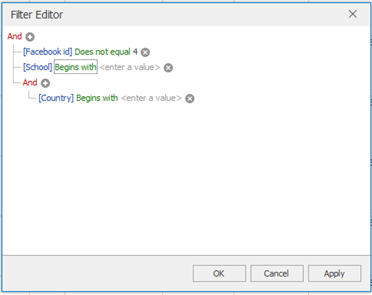 Using the Filter editor, you can define more complex filters for table columns applying logical AND and OR. Select Filter Editor. 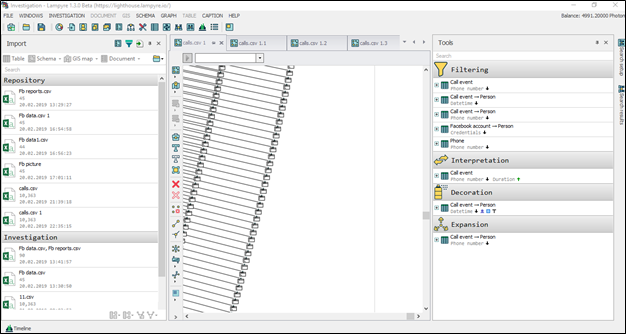 The Filter Editor window opens (Figure 60). Example 1 for using the Filter Editor. For example, in the Filter Editor window we click , strings for setting conditions will be added. We click in the Filter Editor window. Context menu opens (Figure 61). 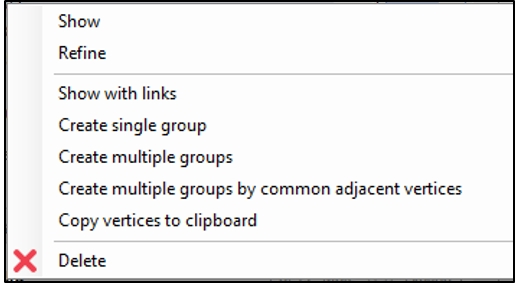 In the context menu, we select Add group. 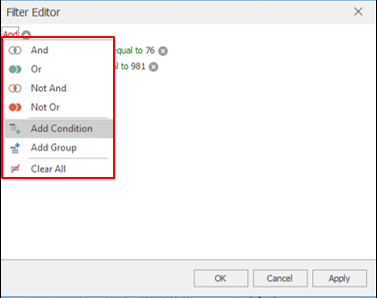 A group is added where you can create filter conditions (Figure 62). We click Country in the filter string. 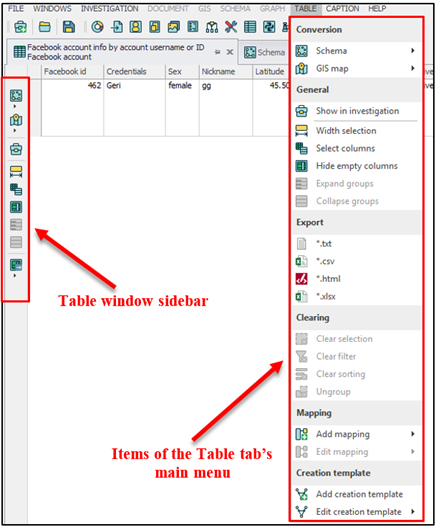 Context menu for selecting a table column is displayed (Figure 63). 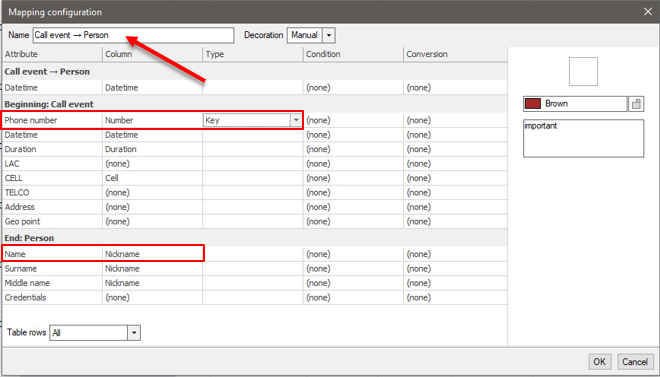 In the context menu, we can select a table column to be used for setting the filter condition. Here, for example, the Country column is selected. You can add other filtering conditions. For example, click Does not equal in a filter string. 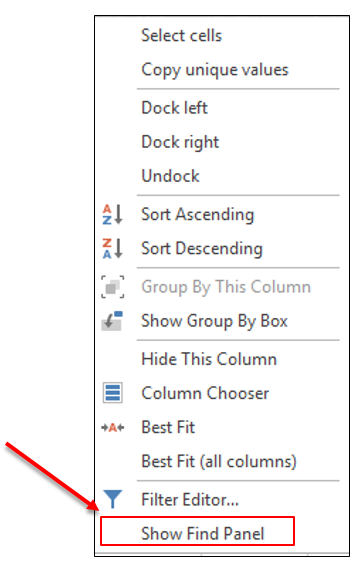 Context menu for selecting column filter condition opens (Figure 64). Click the Does not equal condition and choose Is greater than in the drop-down list. The filter condition is displayed in the filter string. Type in a value that should be less than the value of the column data (Figure 65). 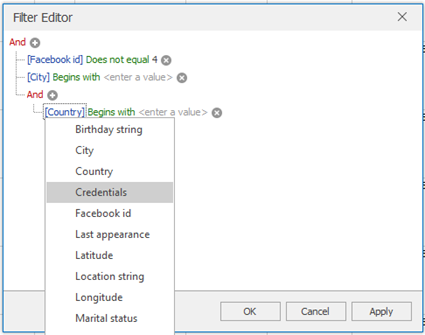 According to this filter condition, all table strings where the value of the Facebook id column is greater than value 4 will be displayed. Repeat steps 5 to 10 to specify conditions for all columns to be used for filtering. The logical AND is used in this process. Click Apply. The table data is displayed according to the defined filter conditions. Example 2 for using the Filter Editor. Type in the values of two table column and the data that these columns should contain (Figure 67). 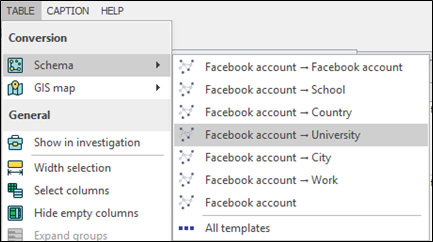 According to this condition, all table rows, where the Facebook id column value is not equal to 4 or the School column value begins with 1, will be displayed. A creation template is required for setting up type attributes in the context of table data. This allows creating complex schemas, graphs, GIS maps or documents containing an unlimited number of elements based on the table data. Click Add creation template in the table sidebar or in the Main menu. The Creation template window opens (Figure 68). In the Creation template window, click Add object. The object is added to the working area of the window (Figure 69). In the Type area, click the drop-down list button and select a type for the object. For example, select Phone. 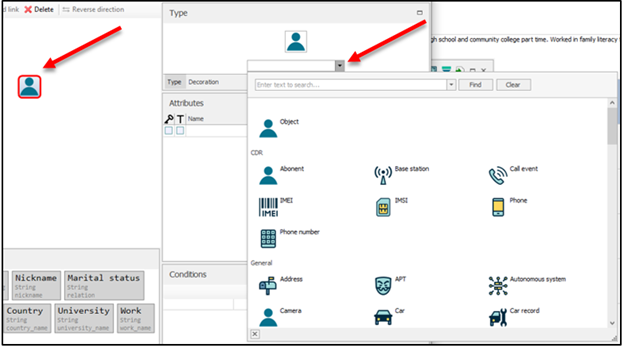 In the Attributes area, all the attributes of the selected object are displayed since the selected type is defined in the Application (Figure 70). The Attributes area. A column with icon. Checking this column defines the identifying (key) attribute. One or more attributes may be defined as identifying ones. The Attributes area. A column with icon. 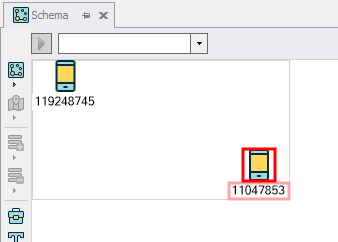 Checking this column defines the attributes to be represented in the caption when the object is shown on a schema. Working area. One of the object's attributes is marked with asterisk (*). The attribute marked with asterisk is identifying one. To set links between attributes and table columns, click the buttons in the Table area and drag the required columns on the respective attributes of the object. Attributes are populated with the selected values of the table. The selected types are also added to the Attributes area (Figure 71). Add the second object into the working area repeating the steps 3 to 6. The second object is added. To remove an object or a link, select this item and click Delete. 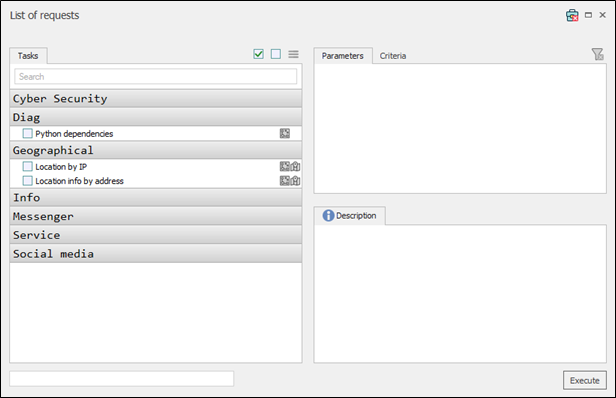 In the working area of the Creation template press and hold Ctrl then select the created objects. In the Creation template window, click Add link. A link is established between the created objects. To set a link type (if the required type is defined in the Application), in the Type area click the drop-down list button and select a type. When you need to set a link type that is not defined in the Application, define an attribute for the link by dragging the data from the Table area on to the link arrow (Figure 72). To change the direction of the link, in the Creation template window click Invert direction. Note. Unlimited quantity of objects and links between them may be added into a template. In the Creation template window, type in the template name in the field located in the upper portion of the window. Click OK. The template is created. 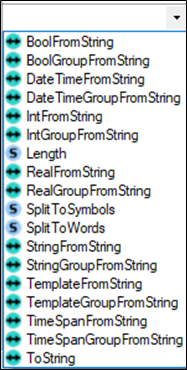 Select the table strings to be used for creating a schema. If no table string is highlighted, by default, the schema is created using the entire table data. Click Schema in the sidebar. A drop-down list appears (Figure 73). Select the prepared creation template in the drop-down list that appeared. 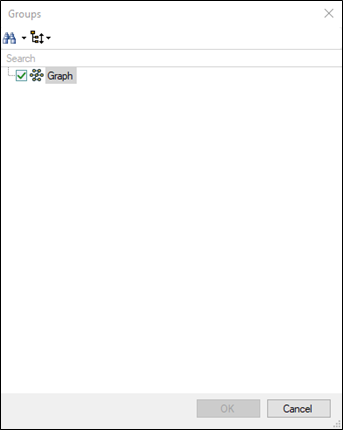 A schema window with graphs built using the template appears. Note. The quantity of vertices created on the schema depends on the selected identifying attribute. Identical data of a table column is transformed into a single instance. Click in the sidebar of the table window. The creation template editing drop-down list appears (Figure 74). In the drop-down list, select a template → Edit. The Creation template window opens with the selected template displayed. Edit the template in the Creation template window. Working with the Creation template window is described in section 4.2.3.1. In the Creation template window, click OK. The creation template is modified. Click in the sidebar of the table window. The drop-down list appears (Figure 75). In the drop-down list, select a template → Delete. The creation template is deleted. Click in the table sidebar or in the Main menu. The Creation template window opens (Figure 68). In the Creation template window, click Add object. The object is added into the working area of the window. 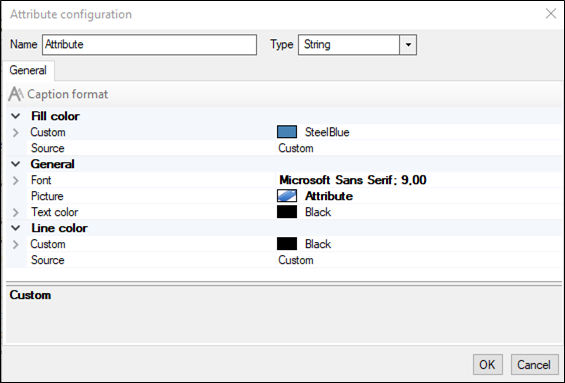 In the Creation template window, in the Attributes area, click an empty string in the Name column. 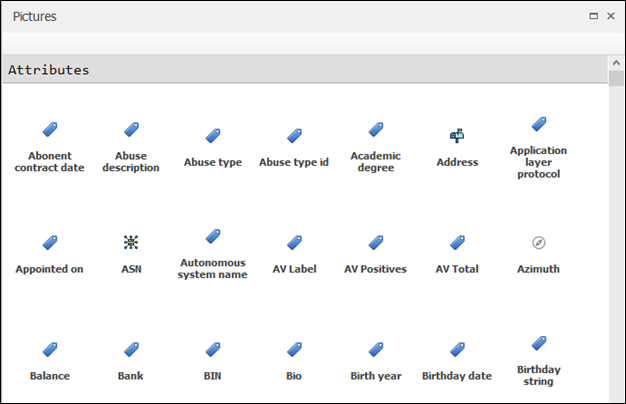 A drop-down list for selecting attributes appears (Figure 76). Select the required attribute in the attribute selection drop-down list. Repeat steps 4 to 5 to select the required set of attributes. In the Attributes area check an identifying attribute. In the Type area specify the object name (Figure 77). In the Table area, drag the table columns on to the corresponding attributes in the Attributes area to link the attributes with these table columns (Figure 78). Setting type attributes mappings to table data is required to enable creating a graph based on the table data. Table data mappings (mapping of the table column to type attributes) should be configured in order to automatically create instances based on the table data. Click Add representation in the sidebar of the table or in the Main menu. 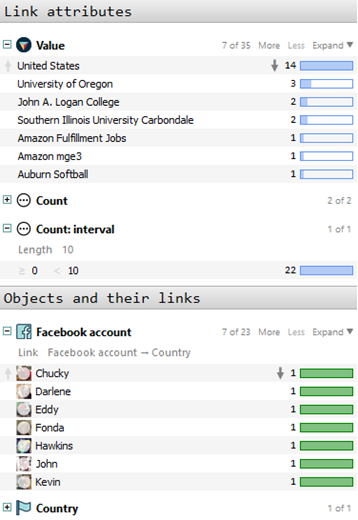 The list of objects and links appears (Figure 80). Click an object. For example, select Call. Select Edit from the context menu. The Mapping configuration window opens (Figure 81). In the drop-down lists of Column, select the table columns that will be mapped to the respective type attribute (Figure 81). In the Mapping configuration window, click OK. The mapping is added. Also, you can configure tools for working with tables. The respective actions are described in section 5.3.6. When generating a table using a request based on a selected script, this script may contain defined mappings between table columns and type attributes. 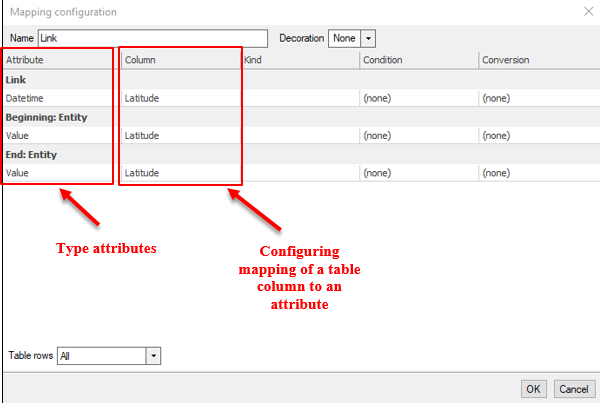 When importing a file with a new structure, you need to configure mapping between table columns and attributes. When uploading a file with a structure that is identical to the structure of a file previously uploaded into the Application, the mapping for the uploaded file structure is saved in the Application. In this case, there is no need to configure the mapping. A schema is a visualization area where graphs and graphic primitives can be visualized. Vertices. A vertex is an instance mapped to a graph. Vertex captions. Vertex captions can be relocated to any point on a schema. Link captions. Can be relocated only along the link line. Link control points. Control points allows you to bend link lines. The user adds link control points manually or automatically (for some kinds of placements). For example, for orthogonal placements control points are added automatically. A control point is required to bend a link line. The user adds graphic primitives on a schema manually. These are shapes like rectangle or rectangle with text required to add graph annotation. A graph on a schema is circumscribed by a rectangle (Figure 82). This rectangle shows the graph items and represents the graph border. Multiple graphs can be built on a single graph. The second graph on a schema is built using the Main menu Graph → New graph. Two graphs created to the same schema will not be connected with each other in any way (Figure 83). But same instances can be visualized on different graphs. Note. It is not recommended to implement multiple graphs on a single graph. Tools for working with schemas are available when a schema is opened. 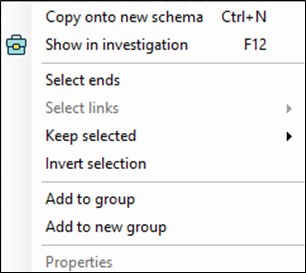 Some items of the Schema main menu and buttons in the Schema window sidebar perform the same operations (Figure 84). See Table 19 for a description of the schema sidebar buttons. Add all leaves to groups. 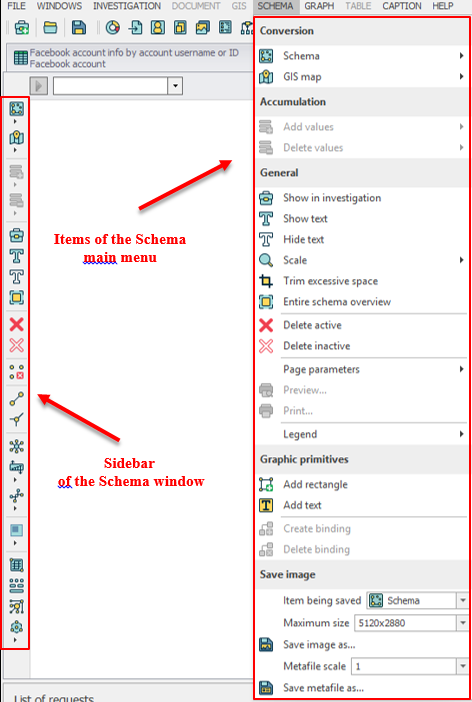 See Table 20 for description of the Schema main menu items not repeated in the schema sidebar. See Table 21 for a description of the Graph Main menu items. Drop-down list for selecting the layout type. Sorting. It allows you to sort the selected items by attribute. Place connected components. It allows you to select connectivity components and locate them side by side without selecting a layout. Copy onto new schema. It allows you to copy an item onto a new schema. Show in investigation. It allows you to select a vertex in any opened window that contains this vertex (for example, in the Explorer or Instances window). Select ends. Selecting the vertices located at the ends of the selected link. Keep selected. Selecting vertices or links that should remain selected. Invert selection. It allows you to select everything else except the items that are currently selected. The currently selected items get deselected. Add to group. It allows you to add an item into an existing group. This operation is performed in the Select groups window. It is impossible to perform this action if there is not group in the Application. Add to new group. You can create a new group of items. Create group with leaves. It allows you to combine a vertex and its child items. Select neighbors, This operation is applicable to the first circle of items. You can select neighbors. Select connected component. It allows you to select a component. Select the shortest paths. It allows you to select the shortest paths. The operation can be performed when two or more vertices are selected. Color levels of connectivity. Depending on the distance from the initial vertex, the color of links and vertices as well as the color of vertex frames is changing from warm to cold color. The closer a link or vertex to the initial vertex, the warmer their color. The more remote they are, the colder their color. Sort selected. It allows you to sort the selected items by attribute. Combine vertices. It allows you to stick together any two instances. Copy vertex. Using this operation, you can copy the selected vertex. Attach binary data. It allows you to add binary data from the user's PC. Attach existing binary data. It allows you to add binary data from investigations. Move to requests. You can go to requests. 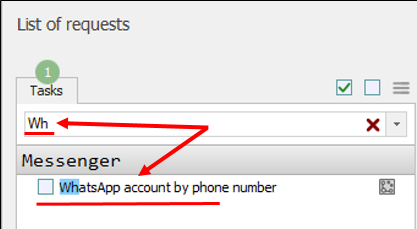 Input parameters of a request are specified. Properties. You can edit values of instance attributes and change visual parameters of a vertex. The Properties window is used for editing. Show in investigation. It allows you to select a link in any opened window that contains this link (for example, in the Explorer or Instances window). Select ends. It allows you to select: the initial and end objects. Add to group. It allows you to add an item into an existing group. This operation is performed in the Select groups window. Properties. This operation opens the Properties window. See section 4.3.3 of this manual for information on working with the Properties window. Edit. 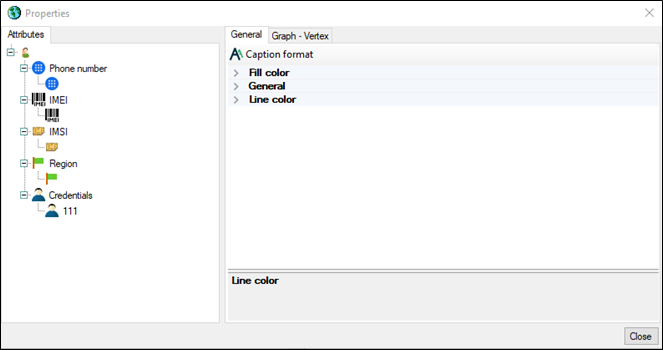 It opens the Caption editor window, where you can edit the vertex captions. The procedure for editing a caption is described in section 4.3.7.4. Select vertex. It allows you to select a vertex. Each visualization item has certain properties. The Properties window is used to configure the visual parameters for an instance. Edits made in the Properties window do not change the instance itself. You can modify properties for either a single object or for all of the objects selected at the same time (in this case, only common properties for the selected objects are available to be edited). To open the Properties window, select Windows → Properties. The Properties window opens (Figure 90). Initially, a schema is just a white background on which graphs and other objects are built. See Table 22 for the configurable visual parameters for a schema that are available in the Properties window. Activity Active color Drop-down list of parameters allowing you to set the color for the active items. Click the button to configure the parameters. Inactive are black and white All inactive items become black and white. Click to select a parameter. Inactive are transparent All inactive items become transparent. Click to select a parameter. Background color Drop-down list of parameters allowing you to set the color for the schema background. Click the button to configure the parameters. Temporary axis mode Click to select a parameter. Show graphic primitives Click to select a parameter. Show legend Click to select a parameter. Print Print page borders Click to select a parameter. Grid Use grid Click to select a parameter. See Table 23 for the configurable visual parameters for a graph available in the Properties window. Calculate radius automatically. Click on to configure the parameter. (i.e., the geometric center of all the items) is calculated. Click on to configure the parameter. - Minimum distance between vertices. This allows you to set the distance between the graph vertices. Editable - Distance between connected components. Distance between independent graphs. Editable - Bundle links. Bundling all the links that cannot be contained in the hierarchical structure where, by default, a vertex with the largest quantity of neighbors is the root of this hierarchical structure. Click to select a parameter. - Place text. Placing a vertex text to avoid intersections. Click to select a parameter. Visual change of items Colorize items Click to select a parameter. 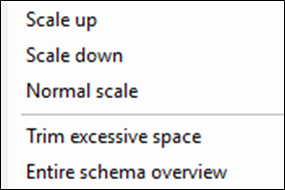 Change size Click to select a parameter. Tree selection Select tree A vertex with the largest quantity of neighbors is the root vertex, provided that the root vertex is not defined. The opacity for all the links that lie outside the selected tree can be modified, thereby changing the color of the items outside the selected tree. Click the button to select a parameter. Bundle links Bundling all the links that cannot be contained in the hierarchical structure where, by default, a vertex with the largest quantity of neighbors is the root of this hierarchical structure. Click to select a parameter. Frame visualization Configuring the graph frame visualization. Click to select a parameter. Show vertex borders Configuring the visualization of vertex borders. Click to select a parameter. Show nodes Configuring the visualization of nodes. Click to select a parameter. Sort lines by date Sorting link lines by date. Click to select a parameter. Search parameters Consider direction This allows you to take the link direction into account when searching. Click to select a parameter. Min search depth Selecting the adjacent vertices based on the depth defined in the graph settings. Click to select a parameter. Sorting Automatic size calculation Automatic definition of how many elements are displayed in a single row. Click to select a parameter. Row orientation This allows you to set the row orientation. Click to select a parameter. Split by type This allows you to sort by type when sorting vertices of different types. Click to select a parameter. Text Show line before text This allows you to set the visualization for the line before the text. Click to select a parameter. Show frame This allows you to set the frame visualization. Click to select a parameter. Show text This allows you to set the visualization for the text. Click to select a parameter. Link color Use gradient paint for links Click to select a parameter. Link ending color Drop-down list of parameters allowing you to set the link ending color. Click the button to configure the parameters. Link beginning color Drop-down list of parameters allowing you to set the link beginning color. Click the button to configure the parameters. Dummy vertices. See Table 22 for the configurable visual parameters of a dummy vertex available in the Properties window. Vertices based on instances. See Table 25.for the configurable visual parameters for a Instance vertex available in the Properties window. Vertices based on binary data. See Table 24 for the configurable visual parameters for a binary data vertex available in the Properties window. Group vertex. See Table 26 for the configurable visual parameters for a group vertex available in the Properties window. Line type Selecting the framing line type. This parameter modifies the line type if the picture framing is defined. Click to select a parameter. Line thickness Selecting the framing line thickness. This parameter modifies the line thickness if the picture framing is defined. Click to select a parameter. Ring. The vertex caption in a circle becomes a part of a vertex. Event. It allows you to display event data. Frame. This representation visualizes the text without a picture. Framing This allows you to set a picture frame. Click to select a parameter. Time axis Locked on axis Click to select a parameter. Date and time This visualizes the representation of an event. By default, the value for the first-time object attribute is used. The value is selected from the calendar. Click to select a parameter. Other Tree root This parameter allows you to change the layout from the tree root when any vertex is set to be this tree root. Click to select a parameter. Hide Click to select a parameter. Text Show text This allows you to show or hide text. Click to select a parameter. 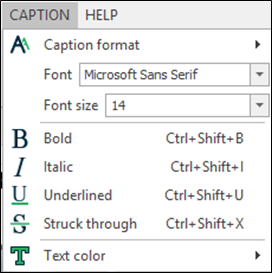 Font Drop-down list for setting the font for the vertex caption. Click to select font parameters. Text color Drop-down list for setting the color for the vertex caption text. Click to select color parameters. 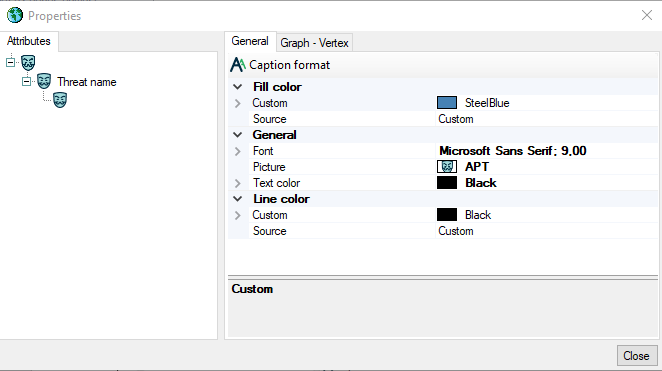 Background color Drop-down list for setting the background color for the vertex caption. For vertices in the form of a frame or event, the color of the vertex itself is modified. Click on to select background color parameters. Show frame Click to select a parameter. Frame color Drop-down list for setting the frame color. Click to select color parameters. Show line before text Displaying a line from the vertex to the text. Click to select a parameter. Fill color Source Background color for a group type vertex. Click to select a parameter. Custom Drop-down list for setting the color. Click to select color parameters. Random Drop-down list for setting the color. Click to select color parameters. Current Drop-down list for setting the color. Click to select color parameters. Line color Source The line color can be seen only if the framing is drawn for a vertex. Click to select a parameter. The configurable visual parameters for an instance vertex include all the parameters for a dummy vertex (Table 24). Instance vertices have additional visual parameters specified in Table 25. Other Own visual parameters Click to select a parameter. Configurable visual parameters of a binary data vertex include all the parameters of a dummy vertex (Table 24). Configurable visual parameters for a group vertex include all the parameters of a dummy vertex (Table 24). Group vertices have additional visual parameters specified in Table 26. Polygon. It visualizes a vertex as a circumscribing rectangle of its component items. Rectangle. Circumscribing a rectangle with a caption. Other Group When grouping is performed, the item links lead to the group as a whole, rather than to the items contained in it. Click to select a parameter. Quantity. This shows the text and the quantity of items in a group. Combination. It shows text and values of all attributes of the group's child vertices. Click to select a parameter. Fill color Source By default, a random color is used for the fill for the group vertex. Click to select a parameter. See Table 27 for the configurable visual parameters of the graphic primitives that can be accessed in the Properties window. Click the button to configure the parameters. Style. Click on to configure the parameter. Color. Drop-down list of parameters allowing you to set the border color. Click the button to configure the parameters. Color. Two similar drop-down lists of parameters that allow you to set the border colors. Click the button to configure the parameters. Gradient direction. Drop-down list for selecting the gradient direction. Click on to make the selection. Background Drop-down list of parameters allowing you to set the background color. Click the button to configure the parameters. Font. Click to configure the parameter. Alignment. Click to configure the parameter. Margins. Drop-down list of margins. Editable fields. Color. Drop-down list of parameters allowing you to set the text color. Click the button to configure the parameters. Dummy links. See Table 28 for configurable visual parameters of a dummy link available in the Properties window. Links from instances. Configurable visual parameters for instance links in the Properties window are similar to the visual parameters of a dummy link listed in Table 28. View Image It is not visualized on a graph. It is visualized in the Instances and Explorer windows. Click to select a parameter. Line type Selecting the line type. Click to select a parameter. Line thickness Selecting the line thickness. Click to select a parameter. Split links. All of the link lines are drawn separately. Random. Arbitrarily drawing of each line individually using control points. Combine into one. Combining multiple links into a single one. The quantity of links contained in the combined link is used as a caption for this link. Group by direction. Visualizing a single link in each direction. Curve Changing the method of drawing lines. The parameter is available when there are control points on a link. Click to select a parameter. Direction Selecting a link direction. Click to select a parameter. Date and time Selecting a date from the calendar. Click to select a parameter. Text Show text Showing or hiding text. Click to select a parameter. Font Drop-down list for setting the font for the link caption. Click to select font parameters. Text color Drop-down list for setting the color for the link caption text. Click to select color parameters. Background color Drop-down list for setting the color for the link caption background. Click on to select background color parameters. Fill color Source Link background color Click to select a parameter. Starting vertex. Color for the start vertex line. Ending vertex. Color for the end vertex line. The color is defined by the vertex fill color. 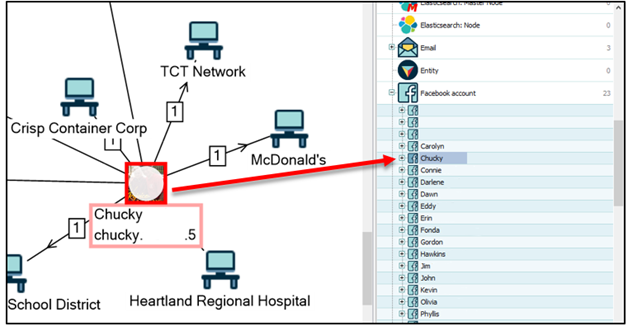 The operation to create a schema can be accessed when the function to enable a graph on a schema is enabled for the table data. If the function to enable a graph on a schema is disabled for the table data, then configure the visualization for the table data on the schema. 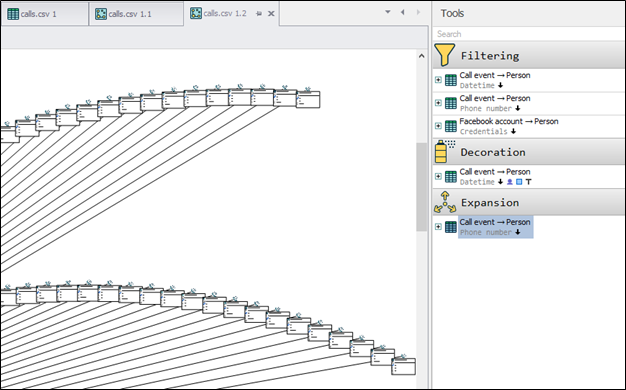 See sections 4.2.3-4.2.4 for how to configure the visualization of table data on a schema. In the Main menu, select Table → Schema. The (creation or visualization) template selection context menu appears. In the context menu, select a schema visualization template and click on its name. A graph is built on the schema based on the table data (Figure 91). Use the mouse wheel to zoom in toward (or out away from) the graph. To move the graph, press and hold the right mouse button and then drag the graph to the required location. Note. A graph may be based on the data for the entire table or on selected or filtered strings in the table. In the Main menu, select File → New schema. An empty schema is opened. Next, add three vertices, for example. See section 4.3.6 (Figure 92) for a description of the vertices that can be added on a schema. In the Properties window, select vertex representation (for example, Event) for all the three vertices. Note. You can manually create a graph with any quantity of vertices. Also, you can create links between vertices, as well as modify the properties of vertices and links. Dummy vertices not tied to instances. Vertices based on binary data. In the main menu, select Graph → Add dummy vertex. A dummy vertex is added to the schema (Figure 94). Dummy vertices are not displayed in the Instances window. If you create a link from a dummy vertex to an instance vertex, or from an instance vertex to a dummy vertex, this link would be a dummy one. A dummy vertex can be copied on a schema an unlimited quantity of times. In the Instances window, click on one of the instances and drag it onto the schema. An instance vertex is created. Note. Each object type instance can be visualized on a single schema only once. However, the same instance can be visualized on unlimited quantity of schemas. Create an instance based vertex in the schema. See section 4.3.6.2 for the procedure on creating a vertex based on an instance. Right-click on the instance vertex. Context menu opens. 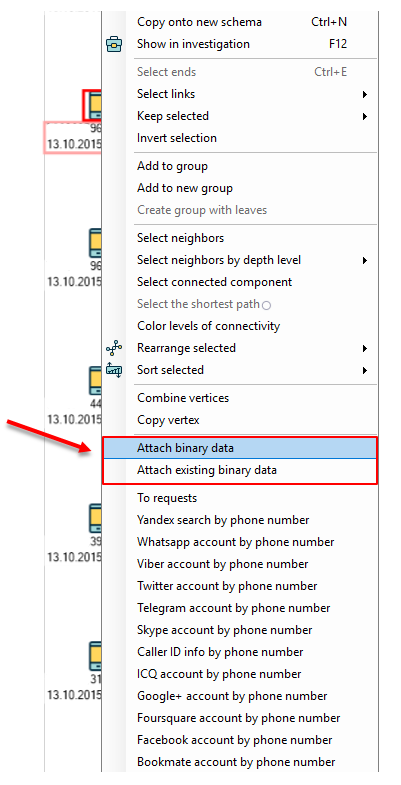 In the context menu, select Attach binary data. A file choice window on the user's PC will open. Select a file on the user's PC. Click Open. A vertex with binary data is created (Figure 95). Also, a dummy link from the binary vertex to the instance vertex is created. Binary data to be attached may be in any format. The added file becomes a part of the investigation. Binary vertices can be attached to instance vertices only. In the context menu, select Add to new group. A new group is created (Figure 96). In the context menu, select Add to group. The Select groups window opens (Figure 97). In the Select groups window, select a group and click OK. The selected instance vertex is added to the group. By setting the visual parameters for an instance via the Properties window, you can define how it is visualized on a schema. Edits made in the Properties window do not change the instance itself. Open a schema. For the description of how to work with a schema, see section 4.3. 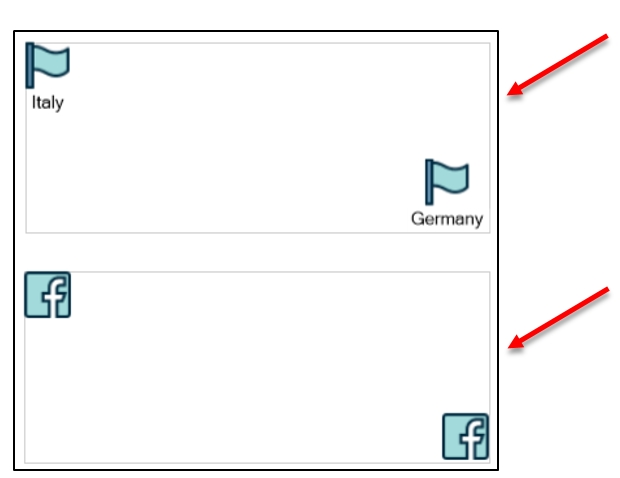 In the schema window, click on an instance. The instance is selected. The Properties window shows the parameters for the selected instance type (Figure 98). Note. 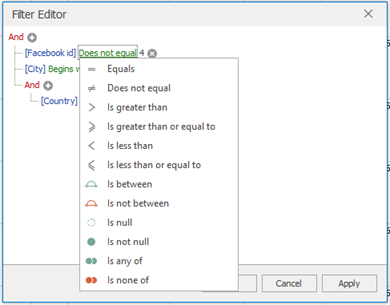 Each instance type has its own set of editable parameters. In the Properties window, in the Image field, click on . The Pictures window is opened (Figure 99). In the Picture window, open any tab. 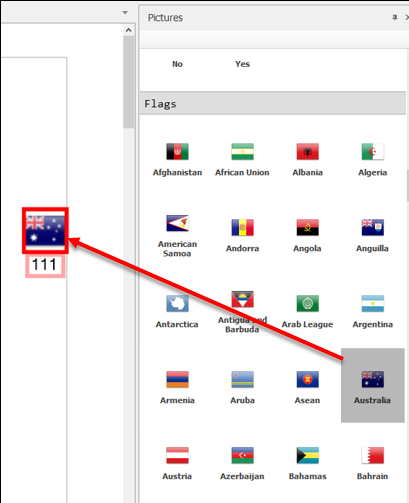 For example, select the Flags tab. Next, click on any flag. In the Picture window, click OK. The visualization of the selected instance is changed (Figure 100). Follow the same procedure to modify any other parameters for an instance visualization. By setting the visual parameters of an instance via the Properties window, you can define how it is visualized on a schema. When you change an instance via the Instances window, you set the default values used to define the appearance of a vertex on new schemas. In the Main menu, select Windows → Instances. The Instances window opens. In the Instances window, right-click on an instance. 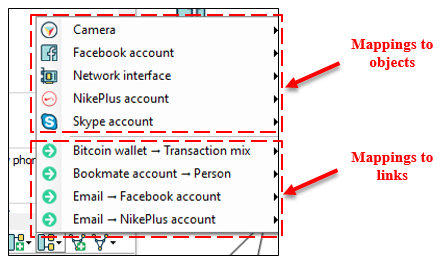 The context menu opens (Figure 101). In the context menu, select Properties. The Properties window opens (Figure 102). Configure the visualization of the instance on the schema. See Table 30 for the configurable parameters for an instance that can be accessed in the Properties window. When you have changed the visualization parameters in the Properties window, click on Close. In the Instances window, the instance with the modified parameters is displayed (Figure 103). When moved to a schema, the instance is displayed with the changes you made. See Table 30 for the configurable visual parameters for instances that can be accessed in the Instances window. General Picture Selecting instance visualization on a schema. Click to select a picture. Text color Drop-down list of parameters that allow you to set the instance caption text color. Click the button to configure the parameters. Line color Source Click to select a parameter. Custom The setting is a drop-down list of parameters that allow you to configure the color for an instance. Click the button to configure the parameters. 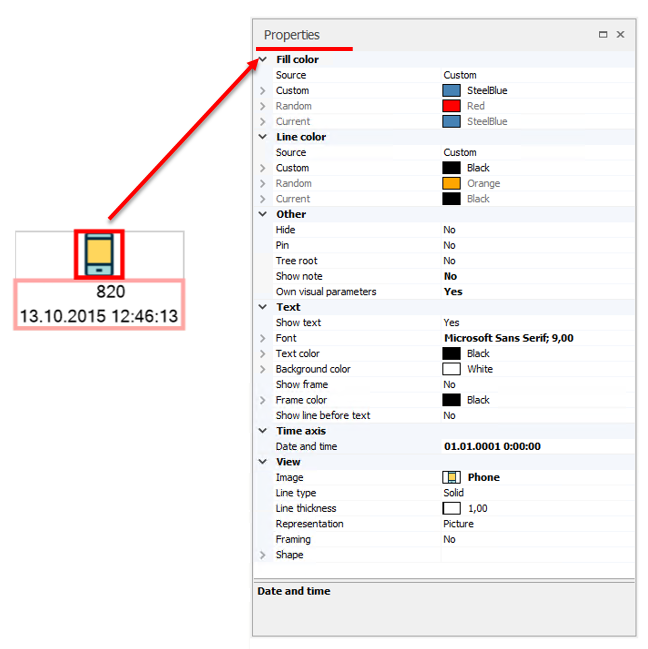 Item color Source Click to select a parameter. Custom The setting is a drop-down list of parameters that allow you to configure the color for an item. Click the button to configure the parameters. Line type Click on to select a line type. Text Show text Displaying the instance caption text. Click to select a parameter. Background color Drop-down list of parameters that allows you to set the instance for the background color. Click the button to configure the parameters. Frame color Drop-down list of parameters that allow you to set the instance for the frame color. Click the button to configure the parameters. Show line before text Click to select a parameter. Option 1. Changing the image using the Properties window. Open a schema with a graph. Right-click on a vertex. The vertex is selected. In the Properties window, in the View group of parameters, select the Image parameter and click (Figure 104). The Picture window is opened (Figure 105). To select an image on the user's PC, in the Picture window, open the Custom tab and click on . A file choice window on the user's PC will open. Select a file and in the Picture window click OK.
To select an image in the Picture window, open one of the following tabs: Attributes, Objects, Links, Decoration, Content, Flags, then click on one of the pictures. The picture is selected. Next, in the Picture window click OK.
Option 2. Changing the image using the Pictures window. In the Windows tab, open the Pictures (Figure 106). In the Pictures window, use the scroll bar to view all possible pictures, select the one you needed, click it, and drag it onto the graph vertex. 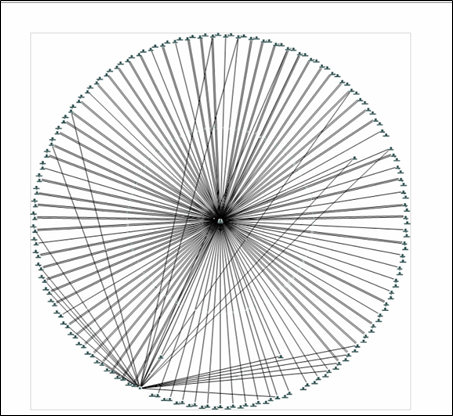 The picture of the graph vertex changes to the one you selected (Figure 107). Option 1. Simple text editing. Right-click a vertex. The vertex is selected. Press F2. The vertex caption text becomes editable. Option 2. Advanced text editing. Select and then right-click the caption of a vertex or a group of vertices. Context menu opens. Simplified. In this mode you can type in text. Default. This mode allows you to configure the visualization for each caption line individually. Each line in a caption is an attribute for an item. 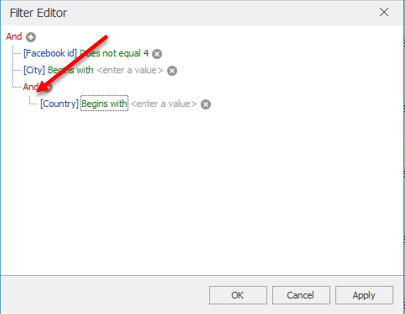 In the Caption editor window, set the required values and click on Create. The changes are saved. Click OK. The caption text is modified. Option 3. Editing text using the Caption window. 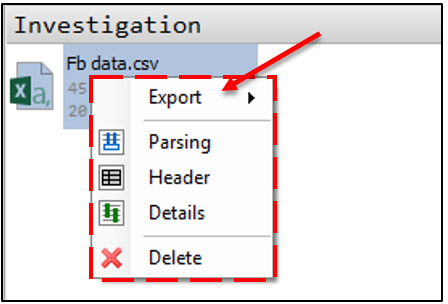 In the Caption window context menu, define the required text parameters (Figure 109). See section 6.1 for a description of the Caption window menu items. The caption text is modified. Note. If you remove an instance with defined incoming and outgoing links, these links are removed together with the instance. When you remove data from a schema, the objects and links are deleted from this schema. Click on a schema object. The object is selected. To select multiple objects, press and hold the left mouse button, then select multiple objects and/or links on the schema (Figure 110). Press Delete. The selected objects and/or links are removed. When you delete an instance via the Instances window, it is removed from all the schemas created within this investigation. 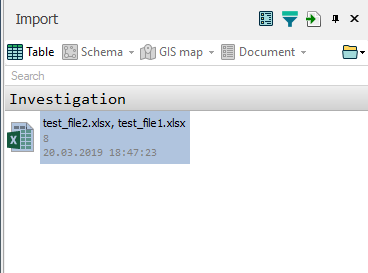 To see the vertex a particular instance belongs to, click the Show in investigation button in the sidebar of the schema window or the Main menu (Figure 111). In the Instances window, select one or more instances and click in the Instances window menu. The instances selected are removed from the investigation. When you delete a link via the Instances window, it is removed from all the schemas created within this investigation. 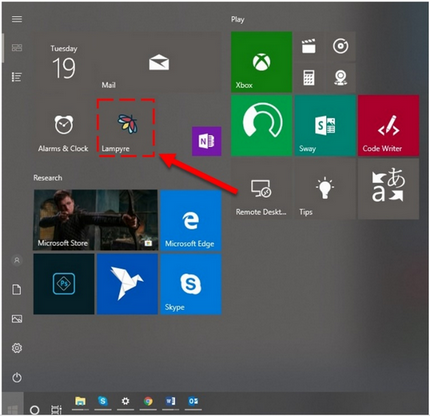 In the Instances window, select one or more links and click in the Instances window menu. The selected links are removed from the investigation. Only object types and/or link types created by users can be deleted. Application types cannot be deleted. 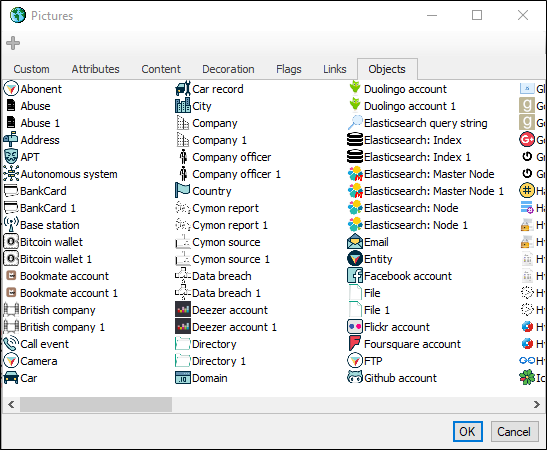 In the Instances window, select one or more types and click in the Instances window menu. The selected types are removed from the investigations (Figure 112). In the Main menu, select File → New schema or select a schema with a built graph. A schema is opened. In the Main menu, select Schema → Add rectangle or Add text (Figure 113). If you selected Add rectangle, a rectangle appears on the schema. If you selected Add text, the text entry window opens (Figure 114). Type text in the text entry window and click anywhere within the schema. The selected graphic primitive with the added text appears on the schema (Figure 115). Open a schema that contains a graphic primitive. Right-click on the graphic primitive. Context menu opens (Figure 116). In the context menu that appears, click Properties. The Properties window opens (Figure 117). Edit the text and modify settings for displaying the text on the schema. Click Close. The text of the graphic primitive is modified. Add a graphic primitive to the schema. 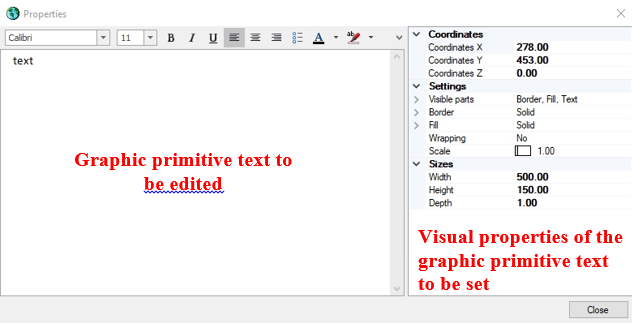 See section 4.3.9.1 for the procedure on adding graphic primitives to a schema. Press and hold Ctrl, then click a graphic primitive and a graph item. The graph item and graphic primitive are selected. In the Main menu select Schema → Create binding. When the graph item is moved, the graphic primitive moves together with it. However, you can also move the graphic primitive itself in relation to the graph Item. Open a schema that contains a graphic primitive bound to a graph item. In the Main menu, select Schema → Delete binding. The binding is deleted. A GIS map is a geographical information map that allows you to analyze data by displaying the locations of objects and their movements. GeoJSON (a point, polyline or polygon). GIS objects. This layer contains objects that have one of any kind of geo-attribute, and there is nothing preventing placing this object onto this layer type. Heatmap. This layer contains objects that have the Point item and there is nothing preventing placing this object onto this layer type. Path. A path is a sequence of object movements. This layer contains objects that have the Point attribute as well as the grouping and sorting attribute. Shapes. The system layer. The user cannot edit this layer. 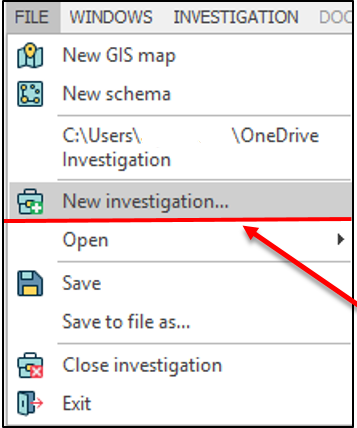 Items of the map window sidebar are the same as the items of the GIS main menu (Figure 118). The map items are described in Table 31. Scale down. This allows you to scale down the map. Normalize scale. This allows you to normalize the map scale. Scale up. This allows you to scale up the map. Show all objects. This allows you to show all objects of the map. In rectangle (in radius/in polygon). Check the GIS objects for the layer. Show in investigation. 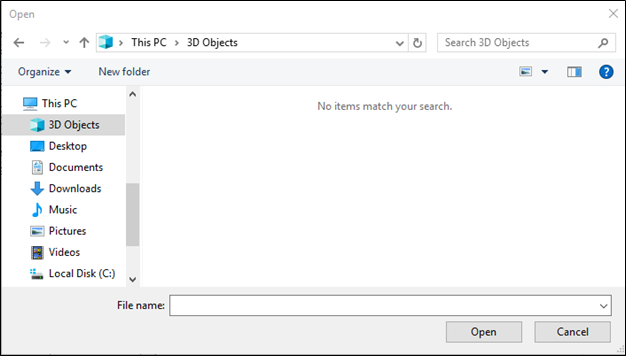 This allows you to select an object in any opened window that contains this object (for example, in the Explorer window). Show captions. This allows you to show object captions. Hide captions. This allows you to hide object captions. Group. It allows you to group objects. Move to requests. You can go to requests. Open GIS map. If there are no highlighted objects on the map, the map parameters are displayed in the Properties window. Customizable visual map parameters in Properties window are shown in table 32. View Tile source Click the button to select a parameter. Combine shapes Choose shape clustering mode. Click the button to select a parameter. Scale Changes the map scale. Show center Click the button to select a parameter. Color mode Changes the color mode of the map. Click to select a parameter. Customizable visual object parameters in the Properties window are shown in table 33. Representation Show point Click to select a parameter. Show caption Click to select a parameter. Show floating picture Click to select a parameter. 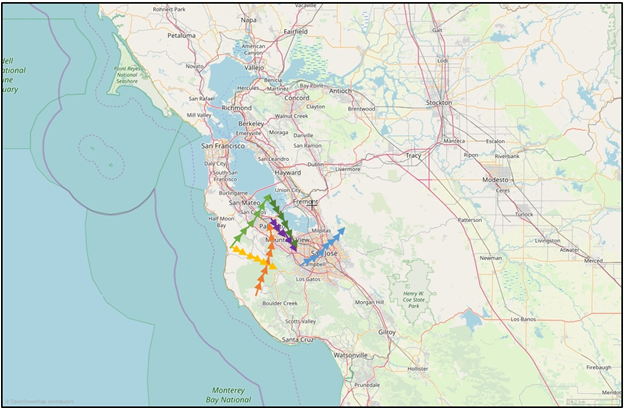 Open GIS map with set object paths. 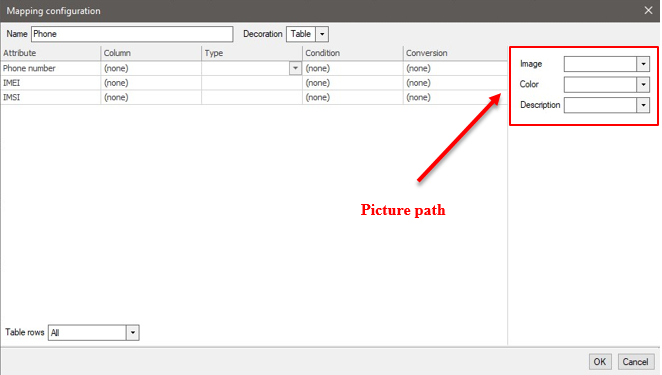 Customizable visual path parameters in Properties window are shown in Table 34. View Animate Option to animate object path. Click to select a parameter. Opacity Allows setting layer opacity. Click to select a parameter. Show Hide or show layer. Click to select a parameter. Show adjacent lines Representation of lines with or without arlines. Click to select a parameter. Subpaths Hides or shows subpaths. Click to select a parameter. Filter Click to select a parameter. 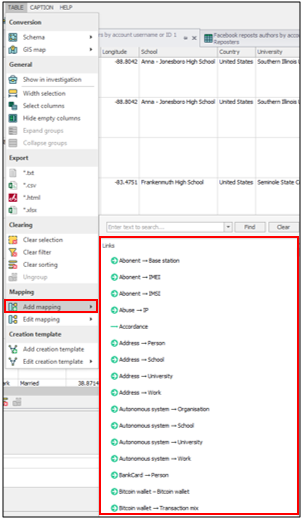 To customize the point parameters, create a GIS heatmap. Customizable visual point parameters in Properties window are shown in Table 34. View Opacity Click to select a parameter. Show Click to select a parameter. Color Drop-down list for selecting a color. Click on the button to select a parameter. GIS map is created based on data that have geo-attributes. If GIS map visualization is set for the table data, you can create a map. If GIS map visualization is not set for the table data, first you have to set it. Setting the Table data visualization is outlined in sections 4.2.3-4.2.4. In the Main menu, select Table → GIS Map. A context menu with visualization templates will open. In this menu, select a GIS map visualization template and click it. A GIS map will be built based on the table data (Figure 121). Note. GIS map may be built based on the whole table data, as well as selected or filtered table strings. Open GIS map. Creation of GIS maps is outlined in section 4.4.3.4. Layer visualization examples are shown in Figures 123-126. In the map sidebar, click , then click where you want to place a tag. The tag is added (Figure 127). To change the tag text, click the text and press F2. The text will become available for editing. Change the text as appropriate. Note. You may move the tag to any location on the map. Additionally, you can change the location of text in relation to the tag itself. Content window. Content window is a visual analysis tool that allows you working with a schema or a GIS map. Timeline window. Timeline window is a visual analysis tool. It displays the instances of the schema arranged by Date and Time attribute. Filtering. 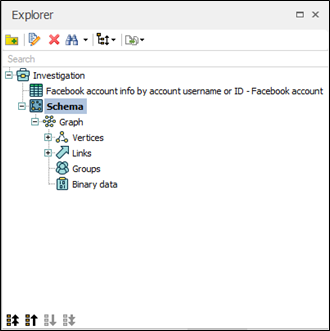 Filtering tool allows linking data in the schema with any of the user’s files. Interpretation. Interpretation tool allows enriching a schema with the data from an imported file. Decoration. Decoration tool allows changing visual parameters of schema items. Expansion. Expansion tool allows adding additional data to the schema in the form of vertices and linking them. Content window is a visual analysis tool that allows you working with a schema or a GIS map. Open a schema or a GIS map. Operations with schemas are described in section 4.3. Operations with GIS maps are described in section 4.4. In the Main menu, select Windows → Content. The Content window opens (Figure 128). 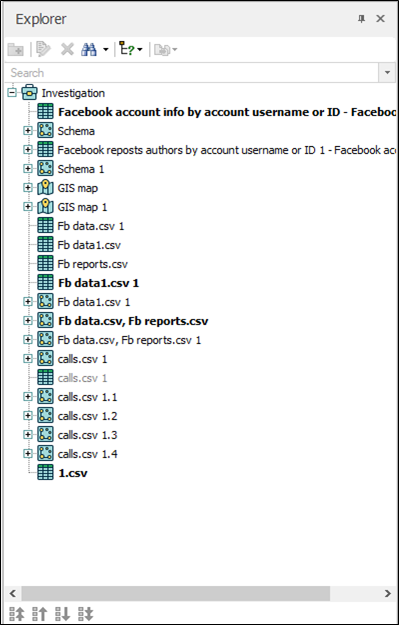 Content window allows viewing aggregation of instances in schema or GIS map according to any attributes. Content window is built based on the schema or GIS map and contains the data displayed in them. If no items are highlighted in the schema or GIS map, Content window will display all data. 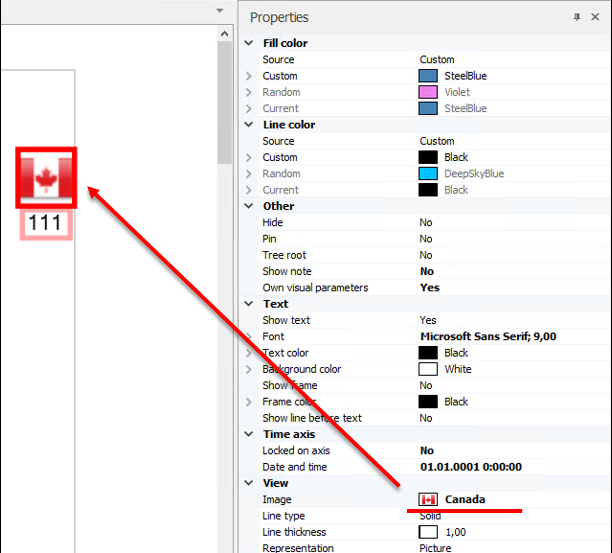 If there are highlighted items in the schema or GIS map, Content window will display all the information on these items. If you select items in Content window, these items will also be selected in the schema or GIS map. 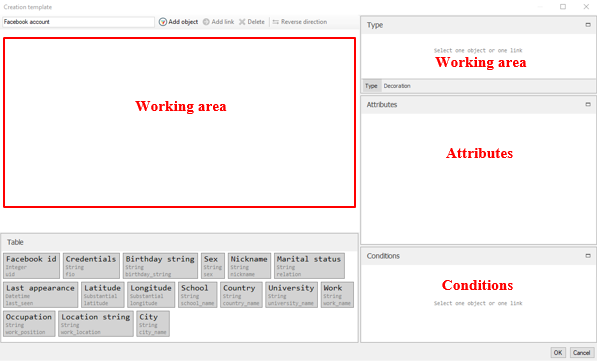 The attributes displayed in Content window depend on the data in the schema or GIS map. For blocks displaying aggregating data, the scale is displayed in blue color. For blocks displaying statistical data, the scale is displayed in green (Figure 129). Actions with data available in Content window are shown in table 36. The numbers show how many attribute values will be displayed of the total quantity. More. 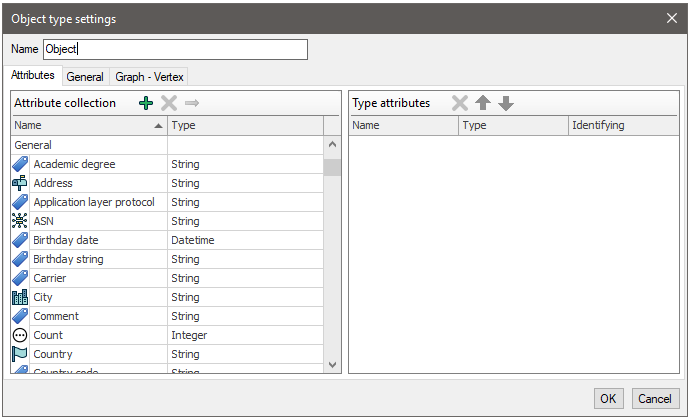 Shows a few more strings of attribute values. Less. Hides a few strings of attribute values. Expand. Expands all strings with attribute values. Collapse. Hides the strings with attribute values. The context menu of an attribute may vary based on data for which the context menu is applied. Show. Highlights all the items in the schema that are selected in Content window. Refine. Filters data, which contains the chosen attribute(s). Show with links. Highlights all the items in the schema with their links for the selected region. Create single group. Groups into one group. Create multiple groups. Groups into a quantity of groups. Create multiple groups by common adjacent vertices. Creates groups by common adjacent vertices. Copy vertices to clipboard. Copies the highlighted vertices to clipboard. Delete. Deletes all the items in the schema that are highlighted in Content window. Open a schema. Operations with schemas are described in section 4.3. Open Timeline window. Operations with Timeline window are described in section 5.2.2.1. Open the Content window. Operations with Content window are described in section 5.2.1.1. Double-click an attribute value in Content window. For example, select an IMEI attribute, value. Timeline window will be rebuilt based on the values highlighted in Content window. Items with values selected in Content window will also be highlighted in the schema (Figure 131). In Timeline window, select a time interval, Content window will be rebuilt based on data selected in Timeline window. These items will be highlighted in the schema (Figure 132). Timeline window is a visual analysis tool. 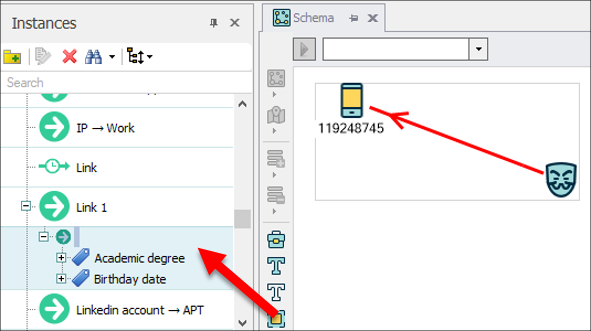 It displays the instances of the schema arranged by Date and Time attribute. In the Main menu, select Windows → Timeline. Timeline window will open (Figure 133). Timeline window items are described in Table 37. Shows the schema items highlighted in Timeline window. Timeline window allows viewing aggregation for a specified time interval. 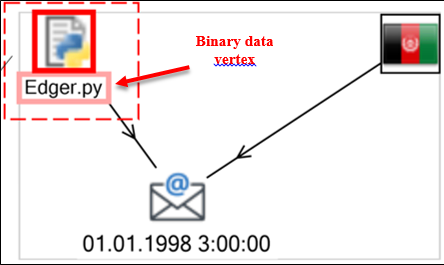 The links visualized in the schema have the Date and Time attribute. Timeline window displays the timeline of schema links. The user is able to view the time intervals and the quantity of links set in these intervals. 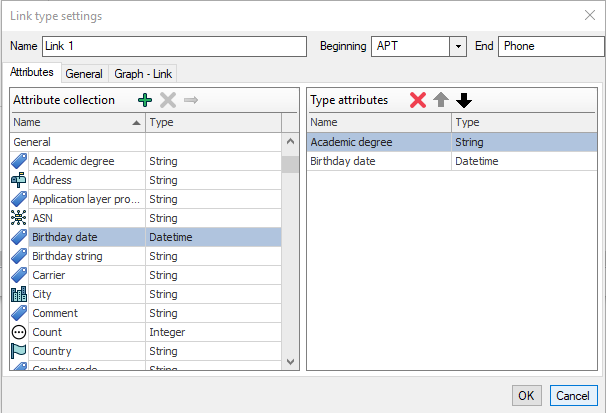 Timed data distribution is shown in the bottom part of the window. Detailed information about the data in the interval highlighted in the bottom part of the window is displayed in the top part of the window. If no links are selected in the schema, Timeline window will display all links. If there are highlighted links in the schema, Timeline window shows the information on these links. The axes steps are determined automatically and cannot be adjusted. For example, if the step is determined as day in the bottom part, it will be determined as hour in the top part, and hourly distribution within each day highlighted in the lower axis will be displayed (Figure 134). If the step is determined as year in the bottom part, it will be determined as day in the top part, and daily distribution within each year highlighted in the lower axis will be displayed. If you select an interval in the Timeline window and click , the items falling into this interval will be selected in the schema (Figure 135). Cross-modularity is an interaction between visualization modules by selecting dependent objects. Visualization modules, such as graph, GIS map, table, any analytical module, for example, Content window, Timeline window, etc., support cross-modularity, which ensures their interaction by selecting objects. For example, if an object on a graph is selected, data are rebuilt in all opened windows providing visualization (Figure 136). Note. If not all items according to the user condition fall into group link, it is drawn in dull red color. If all items according to the user condition fall into group link, it is drawn in red color. Tools for working with imported files are available in Tools window. Tools window shows the tools according to the data visualized in the schema. For example, if the schema is empty, all the tools in Tools window are disabled. In the Main menu, select Windows → Tools. Tools window will open (Figure 137). 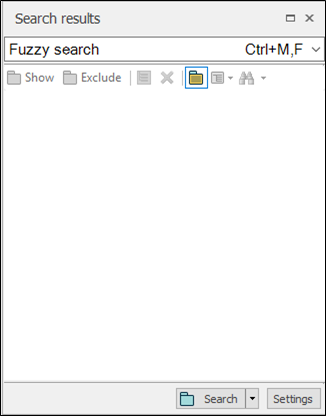 Search field to search the data in the window. Filtering tool. The tool description is given in section 5.3.2. Interpretation tool. The tool description is given in section 5.3.3. Decoration tool. The tool description is given in section 5.3.4. Expansion tool. The tool description is given in section 5.3.5. 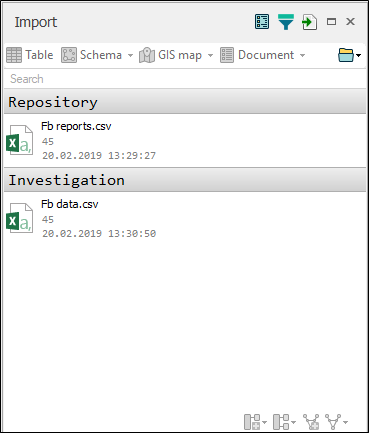 The filtering tool allows data in the GIS map (schema) to be linked with any of the user’s files. The tool performs search in the column of a file added to Application by the user. Import a data file into the Application (Figure 138). The imported file will be displayed in the Import window. Import description is given in section 3.1. 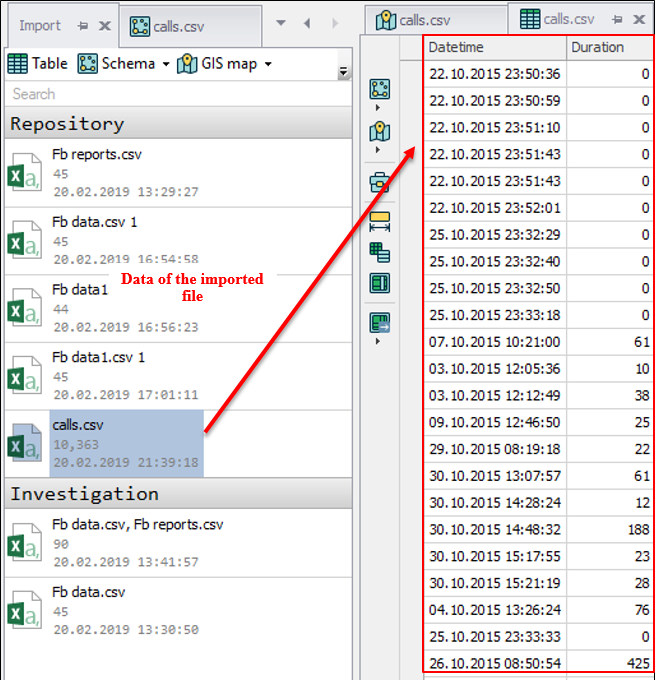 Setup the mapping by specifying how the columns of the imported file are linked with the data. Setting up mapping for filter creation is described in section 5.3.6.1. Open the GIS map (schema). In Tools window, right-click the created filter that was created in step 2. Context menu opens (Figure 139). Select Show operation in the filter context menu. The items of the file, on the basis of which the filter was created, will be highlighted on the schema. Interpretation tool allows enriching a schema with the data from an imported file. 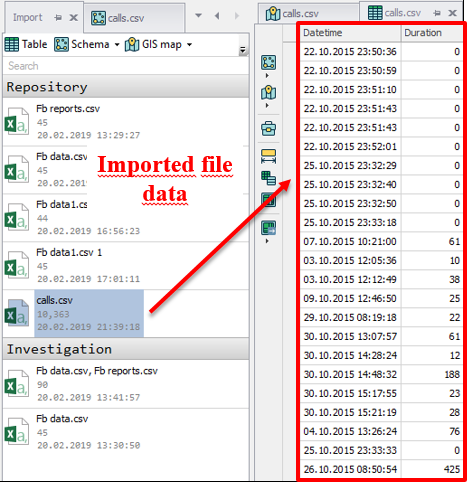 Setup the mapping by specifying how the columns of the imported file are linked with the data. Setting up mapping for combining data is described in section 5.3.6.2. In Tools window, right-click the created filter that was created in step 2. Context menu opens (Figure 140). Select Interpret option in the filter context menu. Duration attribute will be added in the schema of the items specified in the table (Figure 141). Decoration tool allows changing visual parameters of schema items. Setup the mapping by specifying how the columns of the imported file are linked with the data and selecting decoration. Setting up mapping for decoration is described in sections 5.3.6.3-5.3.6.4. In Tools window, right-click the created filter that was created in step 2. Context menu opens (Figure 142). 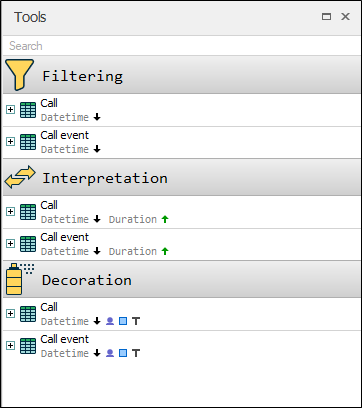 Select Decorate operation in the filter context menu. The items specified in the table will be decorated in the schema (Figure 143). Expansion tool allows adding additional data to the schema in the form of vertices and linking them. Import a file, (Figure 138) the data of which is required to be displayed in the form of vertices in the schema, to the Application. The imported file will be displayed in the Import window. The import process is described in section 3.1. Double-click the imported file to view it (Figure 144). Setup the mapping for the type of link that is supposed to appear in the schema. Setting up mapping for links is described in section 5.3.6.5. In Tools window, right-click the created filter that was created in step 3. Context menu opens (Figure 145). Select Expansion operation in the filter context menu. Graph vertices with links will be created in the schema (Figure 146). Setting up mapping is done via Mapping configuration window. Import a data file into the Application (Figure 138). The imported file will be displayed in the Import window. The import process is described in section 3.1. Click the added file. The file will be selected. In the Import window, click . A context menu with an attribute list will open (Figure 147). Choose the variant by which the data are displayed in the current schema. For example, select Phone object. Mapping configuration window will open. 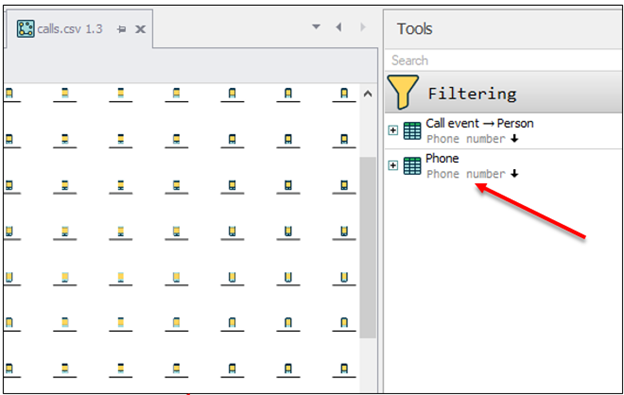 In the Mapping configuration window, link the attributes of the Phone object with the columns of the imported file (Figure 148). In the Phone number string, choose the Number column. In the Phone number string, choose the Key type. In the Name field, type the name of the created mapping. Note. To create a filter, you must specify a key attribute. You may specify two key attributes for data search in the schema by two attributes. In the Mapping configuration window, click OK. The mapping will be created. Open a schema and the Tools window. 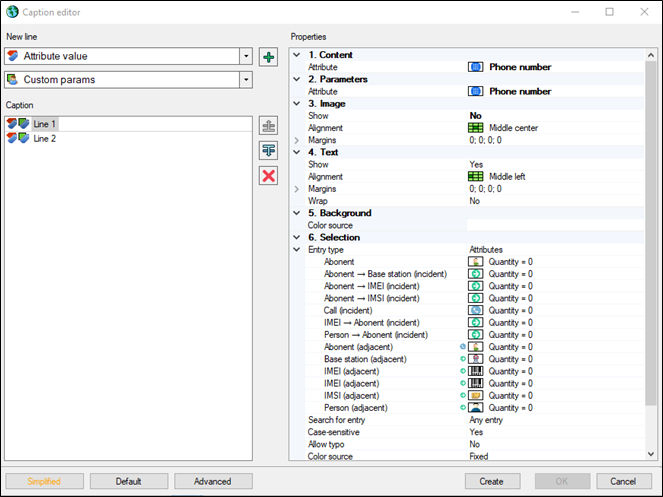 In the Tools window, the Phone filter will appear (Figure 149) specifying the imported file based on which this filter works. The created filter allows searching data in the schema based on data in the loaded file. In Import window, click . A context menu with an attribute list will open (Figure 147). Choose the object, data of which are displayed in the current schema. For example, select Phone object. Mapping configuration window will open. 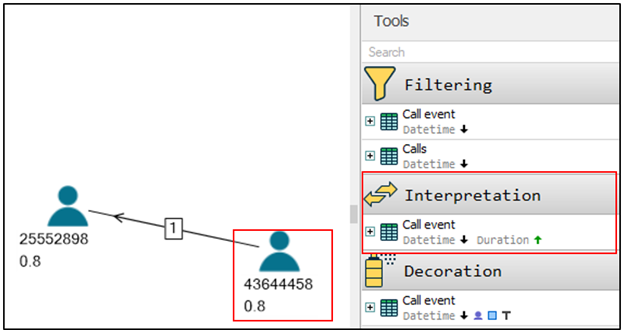 In the Mapping configuration window, link Phone object attributes with the schema data (Figure 150). In the Duration string, choose the Duration. In the Duration string, choose the Extractable type. This means that the Duration attribute will be extracted from the table. The attribute based on which table search will be conducted is considered key. The attribute based on which data will be extracted from the table is considered extractable. enriching the current schema with data from the imported file. Mapping configuration for manual decorating is done via Mapping configuration window. In case of manual decorating, the same picture is set for all vertices. 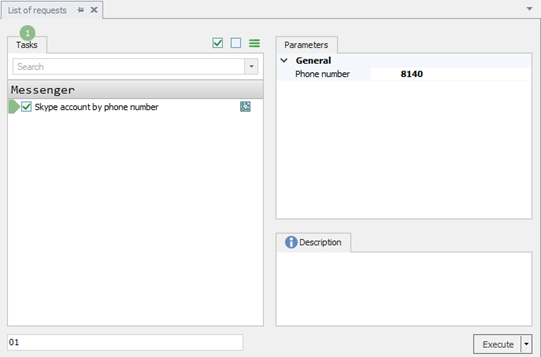 In the Mapping configuration window, link the Phone object attributes with the schema data (Figure 150). In Number string, specify Number A column. In Number string, specify Key type. In Decoration field, select Manual. Additional area for decoration parameter choice will appear (Figure 153). Click the white square The Open window opens to choose a file on the user’s PC (Figure 152). In the Open window, click the required image. The image will be selected. In the Open window click Open. The image will be displayed in the Mapping configuration window. In the Mapping configuration window, click the color selection button and select the required color (Figure 153). Type in the required text in the text field. In the Mapping configuration window, click OK. The created decoration will be displayed in the Tools window. Mapping configuration for decoration of schema items based on data file is performed via the Mapping configuration window. When decorating based on file, different pictures may be set for all vertices. Change the picture of a graph vertex. Change the color of a graph vertex. Add a graph vertex caption. Depending on the file data, based on which decorating is done, you may apply one, two, or all three actions to a schema. Import a decoration data file into the Application (Figure 154). The imported file will be displayed in the Import window. Import description is given in section 3.1. In Decoration field, select Table. An additional area for setting decoration parameters will appear (Figure 155), where you need to specify a table column with the corresponding visual representation. In Picture field, select Picture path. In the Mapping configuration window, click OK. The decoration created based on the file will be displayed in the Tools window. Import a file, (Figure 154) the data of which is required to be displayed in the form of vertices in the schema, to the Application. The imported file will be displayed in the Import window. The import process is described in section 3.1. In the Import window, click . 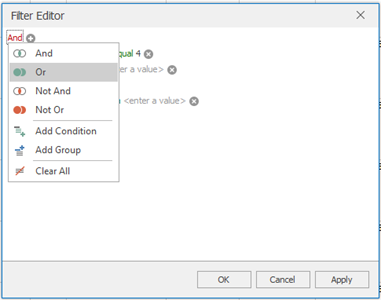 A context menu with an attribute list will open. Choose the mapping by which the new added vertices will be displayed in the schema. 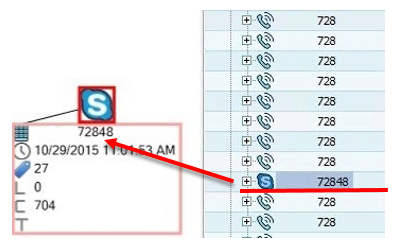 For example, choose the Call event-Person link. Mapping configuration window will open. In the Name string, choose Nickname. In the Mapping configuration window, click OK. The created setting will be displayed in the Tools window. The user can add a file, based on which data filtering will be performed, provided that the structure of the added file is fully consistent with the structure of the previously added file. In Import window, load a file with the structure consistent with the structure of the previously loaded file (Figure 157). The new filter that may be applied to the schema will be displayed in the Tools window. In the Import window, click the name of the file, for which the mapping is set. The file will be selected. In the Import window, click . A context menu will open, where the list of created mappings will be shown (Figure 158). 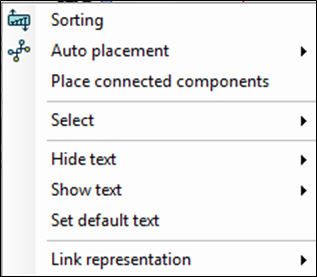 In the context menu of the mapping you need to change, click Edit. Mapping configuration window will open. In the Mapping configuration window, make all the required changes and click Ok. The Filtering tool will be changed. To delete a filtering, you need to delete the corresponding mapping. In the Import window, click . A context menu will open, where the list of created mappings will be shown (Figure 159). In the context menu of the mapping you need to delete, click Delete. 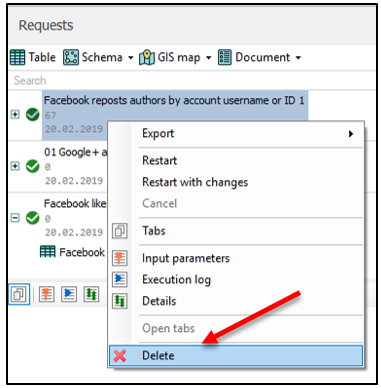 The filtering tools made based on the deleted mapping will be deleted from the Tools window. The Caption window items are described in Table 40. The system provides for different search options, including search by investigation, by schema, by table. Search by investigation is used to search by all data contained in the investigation. 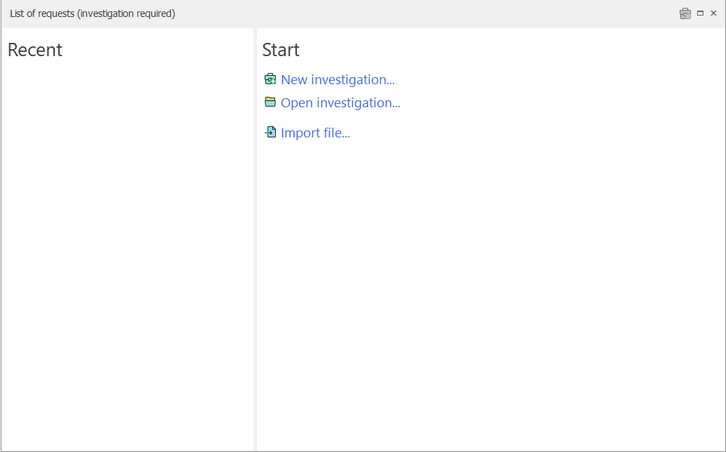 Search by investigation is done in Explorer window. 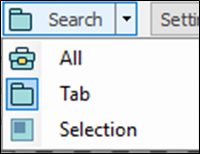 Open Explorer window by clicking Windows → Explorer in the Main menu. The Explorer window is opened (Figure 160). Type the value you need to find in the search bar. 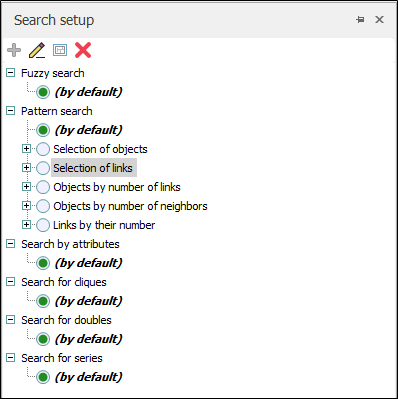 All of the values matching the search criteria will be highlighted in the Explorer window (Figure 161). Right-click on any name for the table column. 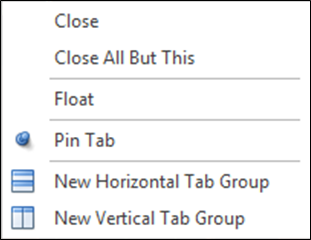 Context menu displays (Figure 162). In the context menu, select Show Find Panel operation. The table data search panel opens (Figure 163). Type the text you need to find in the table into the search field. All matches will be highlighted in color (Figure 164). The table search panel items are described in Table 39. 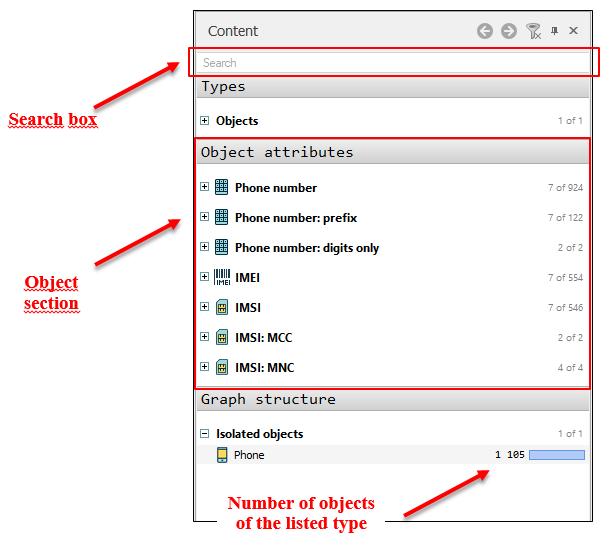 The search panel allows highlighting objects and links matching the chosen criteria in the graph. The list of possible criteria is given in Table 40. 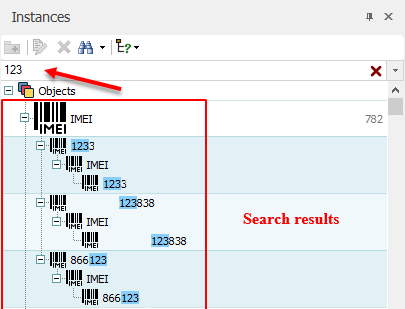 The schema search panel is located in the upper part of the schema window (Figure 165). Define the schema item selection criteria. The schema item selection criteria are given in Table 40. Click . The items matching the search criteria will be highlighted in the schema. In the Content window, a contextual search of the data displayed in this window is performed. Type the value you need to find in the search bar. 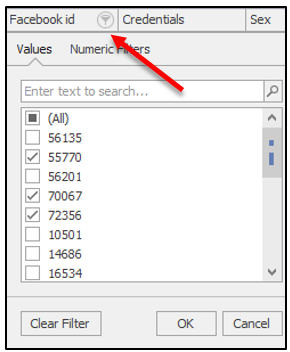 All of the values matching the search criteria will be highlighted in the Content window (Figure 167). You can go to the schema or GIS map from the Content window and all of the objects found remain highlighted. 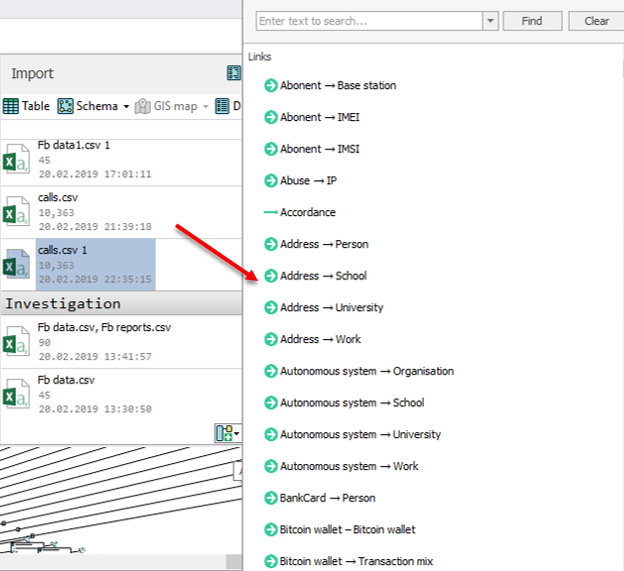 Searching in the Instances window is done using all the instances in the investigation. Open an investigation. For a detailed description of how to work with an investigation see section 2. In the Instances window menu, click . 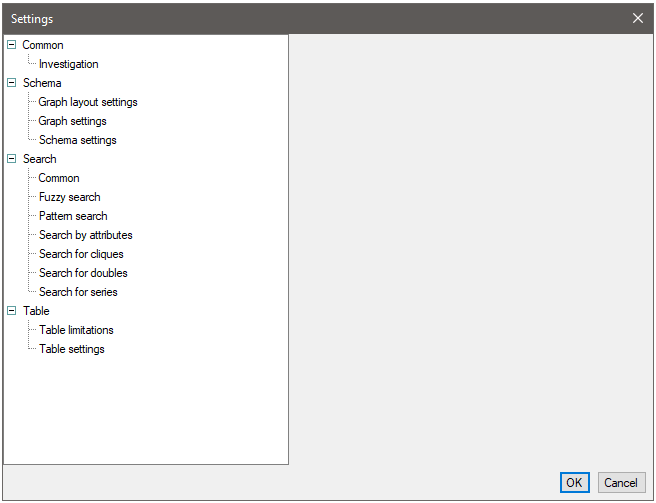 The search settings list opens (Figure 168). Choose the search criteria in the drop-down list. Note. When setting up a search, you need to specify a value ‘Matches...’ or ‘Contains...’ as one of the parameters. Otherwise, the search will not be performed. 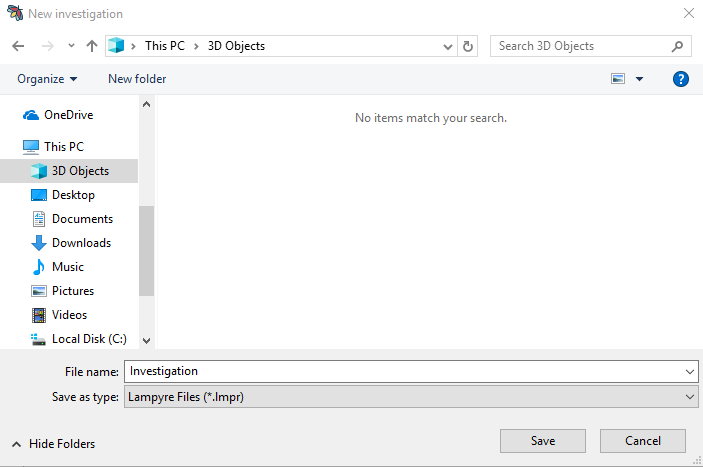 In the Instances window, type in the search value into the search bar. The attributes that have the defined search criteria will be highlighted (Figure 169). To define the search parameters, use the Windows → Search setup window (Figure 170). The Search setup window items are described in Table 39. Consider an example of creating a search setting based on object attributes. Settings of other types are created following a similar procedure. 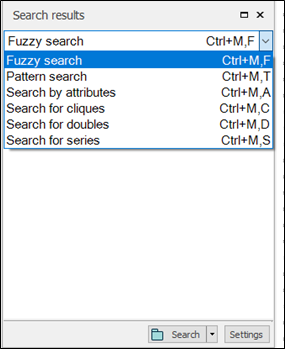 Click a category name to add the setting to (search of doubles/search by attributes/template search/fuzzy search/search for series/search for cliques). Click . The search setting is created. A window for editing the search setting parameters appears (Figure 171). 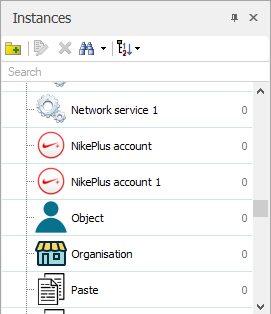 In the left part of the window, check the names of the objects to be covered by the search. will be looking for objects with values that either contain 2 or fewer than 3 or begin with 1. 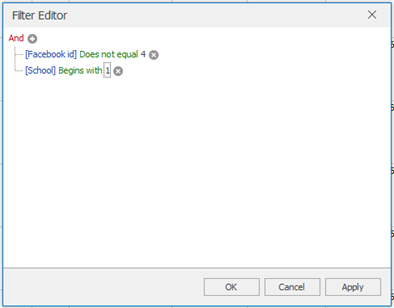 In the list editor, a list of acceptable object values is defined manually and the type or separator used between selected values is specified. 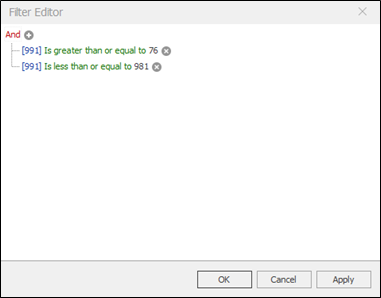 The visual editor allows you to define the search criteria using a template (Figure 172). To create a condition, click . A string for setting the condition parameters is added (Figure 173). Click . 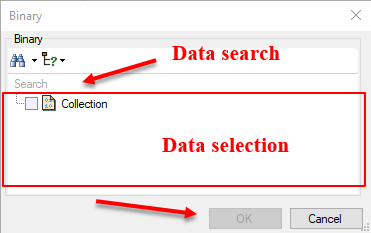 In the context menu that appears, select the required search operator (Figure 174). In the empty string, type the left search operand value and press Enter. The search condition is defined (Figure 175). To add a transformation to the condition, click . Click the added field, and select the required transformation in the context menu that appears (Figure 176). Press Enter. The transformation is added. To remove a search condition, select it and click . The search condition is removed. If you need to execute all the added search conditions, click . If you need to execute at least one of the added search conditions, click . When all the required conditions have been added, click OK. The search setting is defined and added into the list of search parameters for the schema. The editor window is closed. In the Request settings define the search settings to be executed. Open Windows → Search results window (Figure 177). Select a search setting in the drop-down menu (Figure 178). At the bottom of the window area select a search area (everywhere/tab/selected) (Figure 179). Note. When Everywhere is selected, the search will cover all the objects contained in the Application. When Tab is selected, the search is performed in the active tab only. When Selected is checked, only the selected objects will be searched. To modify the search parameters, click Settings. 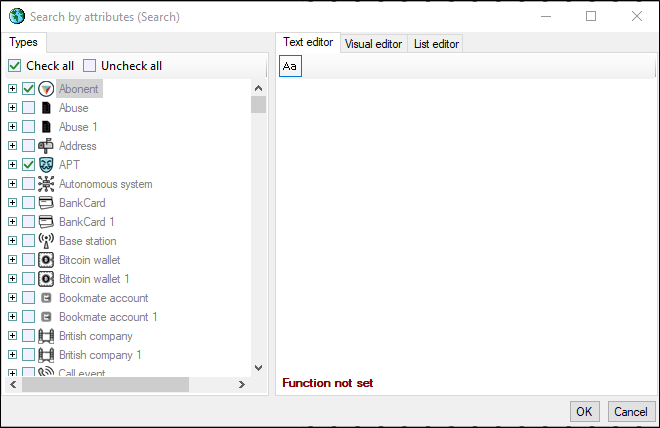 A window for editing the parameters similar to the corresponding window of the Search settings tab is opened. When all the required parameters have been defined, click Search. The search results are displayed (Figure 180). To highlight the results in the investigation, click the required results holding down Ctrl and click Select. The results are selected. In the instance list, right-click on an instance. Context menu opens (Figure 181). 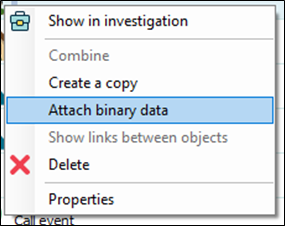 In the context menu, select Attach binary data. The binary data selection window will open (Figure 182). 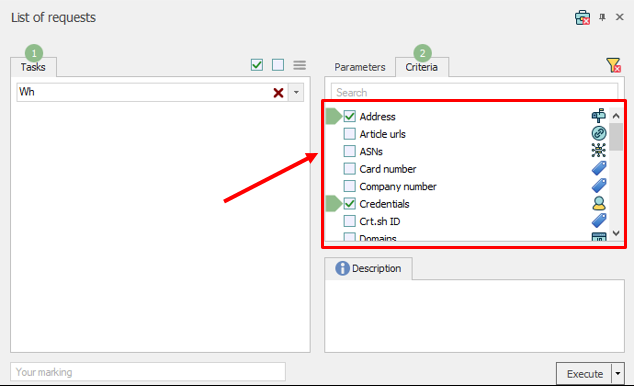 Choose the data from the list of available data by checking the box next to the data items, or perform a preliminary data search in the search bar. Click OK. 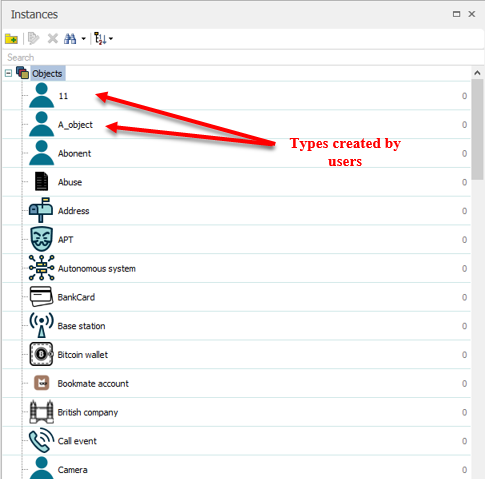 The selected data will be added to the instance and displayed in the Instances window under its attribute list. You may add binary data to a graph vertex that has already been uploaded into the Application and the binary data located on the user's PC. Right-click on a graph vertex. Context menu opens (Figure 183). Attach existing binary data. The binary data selection window appears (Figure 182). 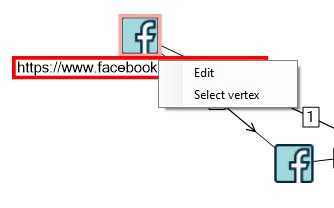 Check the box in the string for the data you need to attach to the graph vertex. Click OK. The selected binary data will be added to the graph vertex. Note. After attaching the data selected on the user’s PC to the graph vertex, these data will be automatically displayed in the Binary data selection window. Users may define the alignment of all visible windows at their own discretion. To change the window position, it is necessary to drag the window’s title. An example of window alignment is given in Figure 185. To define the positions of the windows, right click the window title bar. The action selection context menu appears (see Figure 186). Actions over windows are described in Table 43. After you align the windows in accordance with your requirements, the alignment will be saved after you close the Application and reopen it again. Parameter values can be set as default ones for the Application. Every new item created in the Application will conform to the settings defined in the Settings window. In the Main menu, select Investigation → Settings. The Settings window will open (Figure 187). In the Settings window, click on the setting parameter that you need to change. The setting parameters will be displayed (Figure 188). In the parameter representation block, make the required changes and click OK. Click Cancel to cancel all the changes you've done to the settings. A description of settings that can be changed in the Settings window is given in Table 44. Drop-down list for selecting the possibility of displaying the search panel and panel with conditions. Click on the button to select a parameter. Click on the button to select a parameter.